HALIFAX, NOVA SCOTIA--(Marketwired - June 12, 2015) - Erdene Resource Development Corp. (TSX:ERD) ("Erdene" or "Company"), is pleased to announce that it has closed the second and final tranche of its non-brokered private placement previously announced on May 21, 2015. The second closing resulted in proceeds to the Company of approximately $350,000, which together with the first closing (see the Company news release of June 4, 2015) has resulted in aggregate proceeds to the Company of approximately $1.5 million from the sale of 10,743,405 units at a price of $0.14 per unit. The financing was oversubscribed and was increased from $1.0 million to $1.5 million to satisfy strong investor demand. Each unit consists of one common share of the Company and one-half of one common share purchase warrant, with each whole common share purchase warrant entitling the holder to purchase one common share of the Company at a price of $0.16 for a six month period from the closing date. The Company's advisor, Altus Securities Inc., received a finder's fee of $65,000 and 464,286 finder's fee warrants in connection with the Private Placement. Each finder's fee warrant is exercisable for one common share of the Company at $0.16 per share, for a period of 12 months from the closing date. All securities issued pursuant to the Private Placement are subject to a four-month hold period from the closing date. Net proceeds of the Private Placement will be used to advance the Company's 100% owned Altan Nar gold-polymetallic project in southwest Mongolia and for general working capital purposes. With an initial NI 43-101 compliant mineral resource for Altan Nar in hand, the Company's current work plan includes process test work, evaluations of the mining, engineering, transportation, and marketing options, as well as exploration and development related drilling. June 15 -- Haranga Resources Limited (the 'Company') is pleased to announce the appointment of Mr. George Tumur as a Non-Executive Director of the Company. Mr. Tumur is a Mongolian national and resides in the country with significant experience in the Mongolian mining sector and established relationships at senior levels of government. He currently serves as Joint Chairman of the Board of Directors of Wolf Petroleum Limited (ASX:WOF) and as a director of The Carajas Copper Company Limited (ASX:CJC). As a co-founder and former Managing Director of Hunnu Coal Limited, Mr Tumur was instrumental in growing the company into a $500 million company within 18 months of listing on the ASX. He is a founding shareholder of the Haranga Resources Limited. Mr Tumur has worked in senior management positions for various Mongolian mining companies. Mr. Tumur has an intricate understanding of the mining and legal landscape in Mongolia and has been a forerunner in introducing western contract mining and mineral processing technologies into the Mongolian mining sector. As an Executive Director of Energy Resources LLC (now Mongolian Mining Corporation and listed on the Hong Kong Stock Exchange), Mr Tumur oversaw the establishment of a significant coking coal mine in South Gobi, with the introduction of Leighton Contracting, as well as a large coal processing plant construction by Sedgman in Mongolia. Mr. Tumur has a Master of Science in Mining Engineering and Bachelor of Science in Metallurgical Engineering from Colorado School of Mines, as well as a Technical degree in Mineral Processing from a Ukrainian Industrial Technical School. Recently, Mr Tumur was appointed as the Ambassador Extraordinary and Plenipotentiary of Mongolia to the Republic of Singapore. June 15 -- Guildford Coal Limited (Guildford or the Company) (ASX: GUF) is pleased to advise that Julien Lawrence, its Chief Operating Officer (COO), has acquired 2 million shares of the Company stock on the open market, over the course of the last 2 weeks. Mr Lawrence heads Terra Energy Ltd, a wholly owned subsidiary of Guildford Coal in Mongolia, which is ramping up production at its Baruun Noyon Uul (BNU) mine in South Gobi. As the Company's COO since early 2013, Mr Lawrence's comprehensive knowledge of the business and skillset, have played a key role in the Company's recent transition from explorer to miner. "The management team and Board are delighted with Julien's decision to invest not only his professional time, but also hard earned money into the Company. It shows confidence that the Company is on the right track to deliver shareholder value, which should be reassuring for investors," said Mick Avery, Group Managing Director. Last month, Guildford Coal announced that it had been granted two highly prospective coal exploration licences: one located in close proximity to the BNU mine, and another, named Barum Termes, in North Western Mongolia. Most recently, the Company signed a Memorandum of Understanding to acquire an 80% stake in a large thermal coal project and an associated power generation project with regulatory approvals already in place. Over the past 6 months, Guildford has focused on Asia – restructured its Board and management team, and established a regional office in Singapore, a strategic move to be closer to shareholders, financiers, existing mining operations and customers. June 2 (Mining Journal) The massive Oyu Tolgoi copper-gold underground development in Mongolia could underpin another period of record GDP growth the next time the commodity cycle brings higher prices – much as the open pit mine sparked a hike in GDP during the recent boom – though the country has several hurdles to clear to make that a reality. Turquoise Hill (51% Rio Tinto), Rio Tinto and the Mongolian government made a joint announcement mid-last month, celebrating the agreement of terms for the stage two underground development that had been stalled for two years as the stakeholders tussled over foreign ownership, tax contributions and operating fees. Mongolian Investment Banking Group (MIBG) this week said the "heavy lifting" for the development had now been passed to Rio Tinto. The implication is that remaining departmental approvals should be relatively straightforward under a government that has shown itself determined to improve investor sentiment, following a damaging period of nationalistic policy that saw GDP and foreign direct investment fall through the floor. "Credit where credit due, this is a huge breakthrough, requiring a step change in leadership and negotiations by the government of Mongolia," MIGB said in a note. "Resolution of disputes (eg OT, 106 licenses), legislative reform (various) and agreements with other sovereigns (eg China and $1 billion from India for rail last week) supports the government of Mongolia and Mongolia as an investment destination regaining creditability and providing the foundations to turn around the FDI driven economy. 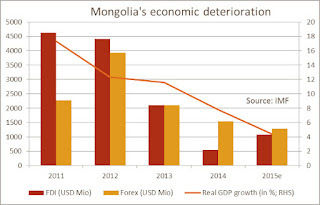 "Trust takes time to regain, but recent reform provides a better investment environment than that which supported Mongolia becoming the world's fastest growing economy because of OT stage one – stage two is the catalyst for the next cycle." The focus has now transferred to Rio Tinto and its ability to execute on financing, which has been continuously deferred and is estimated at some US$5.4 billion. Turquoise Hill chief executive Jeffery Tygesen has previously said finance could be confirmed as early as the fourth quarter this year. The development of OT is widely seen as the limiting factor on the future prosperity of Mongolia's mining sector and MIBG believes the progression of stage two will mean improved recognition for what it termed "special situation plays" tied to Mongolia's economic well-being. Included in this group are other copper exploration and development companies. One such company is Kincora Copper, which has been determinedly pushing forward its Brown Fox copper exploration project. The Canadian-listed explorer's flagship asset has shown similarities to OT at an earlier stage and the company has continued to invest in Mongolia over a period during which others fled the country en masse. Kincora chief executive Sam Spring told Mining Journal life was still going to be challenging for companies positioned in Mongolia, particularly those in the junior space, but movement on OT had provided some much needed impetus for the sector. "Mongolia is off the radar for most [investors] but the precedent of stage one should support things turning around pretty quickly once the project financing is locked down for stage two and construction starts," he said. Should this turnaround take hold, there is potential for Mongolia to make a better fist of things than it did during the most recent cyclical high. Fear of revisiting the doldrums created by nationalistic policies in 2011-2012 could very well clear the path forward for sustainable growth in the mining sector based on a relatively stable and competitive regulatory environment. MIBG likened the policy evolution and mineral potential in Mongolia to the Chilean copper industry in the 1970s or the Western Australian iron ore sector in the early 2000s. But the challenging (read: volatile) politics in Mongolia are a far cry from Western Australian politics or even the free-market dictatorship in Chile during the comparable period. Mongolian politics is still intrinsically linked to the domestic business world and has suffered from overtly populist policy leading into elections. The breakthrough in communication between Rio Tinto and the government has come at a quiet time in the political cycle. Many may only be convinced if OT and the wider mining industry can continue to move forward as the country heads into legislative elections next year and presidential elections the year after. Ulaanbaatar, June 12 (MONTSAME) At the Stock Exchange trades on Friday, a total of 69 thousand and 713 units of 17 JSCs were traded costing MNT 33 million 845 thousand and 698.00. "Merex" /45 thousand and 071 units/, "Genco tour bureau" /13 thousand and 641 units/, "APU" /6,514 units/, "Hermes center" /2,565 units/ and "Tavantolgoi" /700 units/ were the most actively traded in terms of trading volume, in terms of trading value were "APU" (MNT 22 million 924 thousand and 745), "Merex" (MNT four million 135 thousand and 771), "Tavantolgoi" (MNT two million 814 thousand and 950), "Talkh chikher" (MNT one million and 280 thousand), "Genco tour bureau" (MNT one million 122 thousand and 676). The total market capitalization was set at MNT one trillion 364 billion 530 million 411 thousand and 727. The Index of Top-20 JSCs was 14,325.01, increasing 0.29% and the all index of MSE was 989.97, increasing 0.19% against the previous day. Ulaanbaatar, June 12 (MONTSAME) Five stock trades were held at Mongolia's Stock Exchange on June 8-12, 2015. In overall, 644 thousand and 168 units of 40 JSCs were traded costing MNT 14 billion 560 million 224 thousand and 991.00. "BDSec" /237 thousand and 300 units/, "Merex" /49 thousand and 552 units/, "Genco tour bureau" /23 thousand and 394 units/, "APU" /20 thousand and 095 units/ and "Tavantolgoi" /6,260 units/ were the most actively traded in terms of trading volume, in terms of trading value were "BDSec" (MNT 415 million 295 thousand and 700), "APU" (MNT 70 million 846 thousand and 195), "Tavantolgoi" (MNT 24 million 640 thousand and 485), "Bayangol hotel" (MNT 22 million and 040 thousand) and "Darkhan nekhii" (MNT six million 012 thousand and 800). The total market capitalization was set at MNT one trillion 364 billion 530 million 411 thousand and 727. The Index of Top-20 JSCs was 14,325.01, and the all index of MSE was 989.97. June 12 (MSE) On 12 June 2015, representatives from "With Investment" and "KDB Daewoo Securities" visited to Mongolian Stock Exchange and held meeting with Angar.D CEO of MSE. During the meeting, Angar.D presented information about existing policies and activities of MSE, future development trend of capital market and government retail bonds trading. Representatives of "With Investment" and "KDB Daewoo Securities" acquainted information about investment opportunities in domestic market, and they expressed their interest on Government retail bonds. June 8 (BDSec) Looking back to 2014, the local economy in Mongolia decelerated significantly and likely grew at a much slower rate than headline GDP of 7.4%. 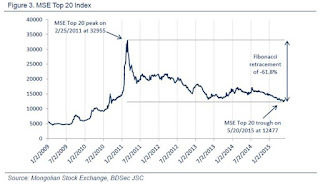 Uncertainty over Phase 2 at Oyu Tolgoi, weak coal prices and a large drop in Foreign Direct Investment (FDI), negatively impacted results at many MSE listed companies last year. Despite these headwinds, several companies continued to experience outstanding top and bottom line growth, though this did not generally translate into higher stock prices. 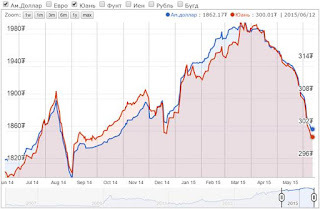 In 2014, the MSE Top 20 was down 16%, with the Mongolian Tugrik down 20% vs. the US Dollar. For companies posting strong growth in revenue and earnings, multiples have contracted to the point of extreme undervaluation by any measure. With a long awaited deal to restart underground construction at Oyu Tolgoi recently reached, Mongolia is again a country Frontier Investors will begin to allocate capital. Looking forward, FDI from Oyu Tolgoi's Phase 2 expenditures is expected to total $9B USD by 2023, but there will be a multiplier and halo effect from this investment, resulting in even greater economic activity. Both India and the UAE made $1B USD commitments to Mongolia for infrastructure investments recently, with many other multi-billion USD prospective projects awaiting the GOM's approval. As investors regain confidence, stock prices will recover and multiples will expand. We think the below equities represent excellent opportunities for investors to begin to gain exposure to the local market. It's not often you can buy companies growing earnings 30%- 150% with a trailing multiple of 5x-6x, but it can be done in Mongolia, for the time being. Following the signing of the OT Investment Agreement (IA) in October 2009, the MSE Top 20 went on to appreciate by nearly 320%, before topping out at 32,955 in February 2011. Conversely, the MSE Top 20 fell by 29% following February 2013, when Parliament passed a resolu­tion to cancel the IA and froze OT's bank accounts, among other anti-foreign investment actions. 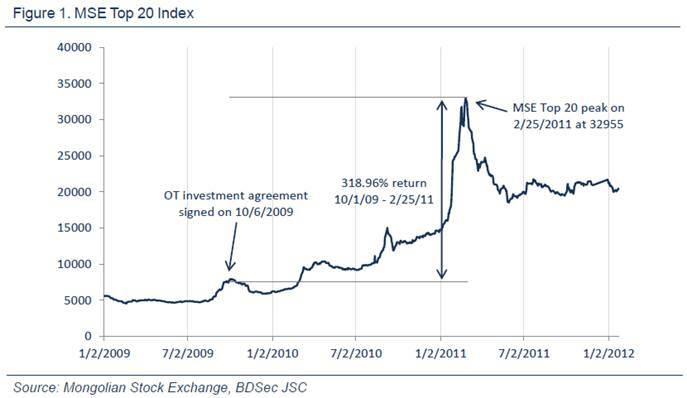 February 2013 was the beginning of a protracted dispute between the GOM and OT, which weighed heavily on stock prices and investor sentiment for over two years. 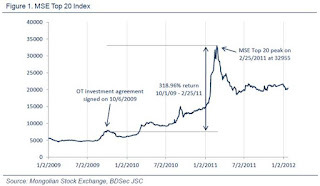 The correlation between OT progressing and investor sentiment (and stock prices) is quite obvious, hence, we strongly believe MSE Top 20 put in its bear market low on May 20 2015 at 12,477. Interestingly enough, the MSE Top 20 peak-trough retracement was -62.14%, eerily close to a Fibonacci retracement (aka "The Golden Mean) of 61.8%. 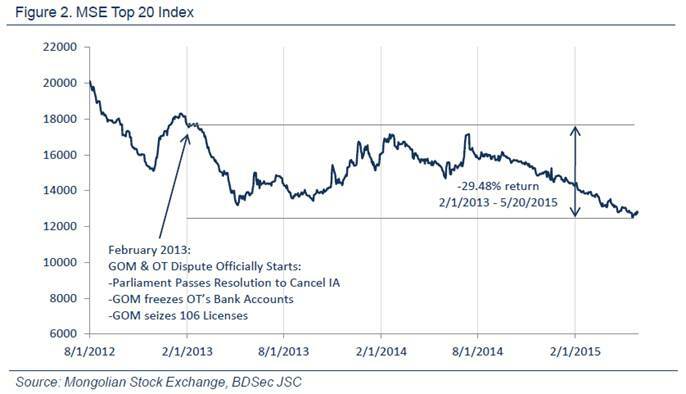 This is the third year we've published our "Quantitative Look at Mongolian Equities." For reference purposes, we suggest you also review our 2013 and 2014 notes here and here. As a reminder, we assign a proprietary numerical score to several traditional growth and value metrics and rank these stocks based on the total. Given that the number of companies posting strong financial performances narrowed in 2014, we have eliminated our Proprietary Screen, which proved overly redundant to the below rankings. The 16 stocks which made the cut for our Growth Screen grew revenue and earnings by an average of 45% and 55%, respectively and trade at an average trailing P/E ratio of 22.5x. While those numbers are quite cheap on a PEG ratio, 6 of the below companies trade for between 5x-8x 2014 EPS, which is dirt cheap considering their rapid growth rates. The stocks on our Value Screen grew revenue and earnings by 17% and 118% on average and collectively trade at a trailing P/E ratio of 9.9x. As mentioned earlier, multiples for the best performing MSE listed companies have contracted, which resulted in many more "growth" stocks cross populating our "value" screens versus prior years. While these screens have proved to be a valuable tool for investors over the last three years, they shouldn't be used in isolation when making investment decisions. There are many high quality companies that didn't make our lists due to a variety of factors. Companies which are more cyclical, or carrying debt denominated in USD (or both), have been impacted severely as the Mongolian economy approached cri-sis levels in 2014 and early 2015. While the Mongolian Tugrik has rallied 6-7% off the worst levels seen in early 2015, we don't expect a meaningful recovery in the local economy until 2Q 2016 when OT Phase 2 spending is projected to begin. But make no mistake, a recovery is now underway and since equities are discounting mechanisms, we expect an imminent rally. Mongolia's Stock Market Capitalization/GDP ($670M USD/$12.4B USD) is 5.4%, which ranks Mongolia among the cheapest stock markets in the world, based on this particular metric. The best way to understand these companies is to hop a plane and come to Mongolia to see things for yourself. BDSec hosts several investor trips each year where we schedule meetings with local managements, including plant and facility tours. During these trips, investors are always fascinated by the possibilities they see for these companies and the country as a whole. June 12 (Bloomberg) -- Mongolia meets target to sell 40b tugrik ($21.5m) of treasury bills with 12 week maturity at auction Thursday, according to central bank statement. * NOTE: Mongolian tugrik is world's best performing currency versus the dollar over the past month, according to Bloomberg data. Also, the export amount fell by 2.7%; and import amount 31%. Therefore, the benefit of the foreign commerce balance is USD 422 million. Statistic proved that transportation by the rail and air has fallen because of the economic crisis. (Railway transportation reduced 5.6%; passengers 15%). (Airway transportation reduced 22.7%; passengers 14%). During the first 5 months of 2015, the amount of unqualified credits reached MNT 738 billion. This means it has increased 19% more than last year. The amount of the over-run credit debts reached to MNT 600 billion; more than 57% than last year. The National Statistics Commission informed that meat price has remained constant over the last 2 months. The price of food products and drinks has increased 0.8%, clothes 0.5% on last month. Depending on these small changes, the rate of inflation has increased 0.4% on last month and 8% on last year. June 12 (gogo.mn) "Tenkhleg Zuuch" company conducted research on "House Price Index as of May 2015" by the order of Bank of Mongolia and the research was introduced by the CEO of "Tenkhleg Zuuch" B.Batzorig. House Price Index was estimated by collecting information of 4,538 old and new housings. House Price Index as of May 2015 is at 16.8 percent which increased by 0.2 percent compared with the previous month. However, decreased by -1.8 percent comparing to the beginning of the 2015 and decreased by -5.4 percent comparing to the same period of the last year. New housing price index is amounted at 26.7 percent which dropped by -0.4 percent comparing with the previous month. However, decreased by -0.03 percent comparing with beginning of the 2015 and increased by 0.5 percent comparing with the same period of the last year. Old housing price index is amounted at 10.0 percent which dropped by -0,6 percent compared with the previous month, -5.3 percent comparing to the beginning of the 2015, -9.8 percent compared with the same period of the last year. Researcher and lecturer of National University of Mongolia D.Byambasuren stated that although prices for new and old housing are decreasing, total House Price Index has raised. However, 0.2 percent, -0.4 percent, -0.6 percent is very small which can be considered as no change. Moreover, number of housing supply to the market is stable, sales for housing and purchasing power of residents both have decreased, reported by the CEO of "Tenkhleg Zuuch" LLC. As of May 2015, housing sales was decreased by 27 percent compared with same period of the last year. As of April 2015, about 950 old housings were traded and it has dropped to 850 housings in May which is a 19 percent decrease comparing to the same period of the last year. Distressed construction of new housings is seven times higher than the same period of the last year. Ulaanbaatar, June 12 (MONTSAME) In the first five months of this year, 33,281 mothers delivered 33,493 children (live births), decreasing by 90 mothers or 0.3% and by 107 children or 0.3% against the previous year. Infant mortality reached 537, showing a decrease of 3 children or 0.6%; under-five mortality reached 618, decreasing by 19 children or 3.0% against the previous year. Ulaanbaatar, June 12 (MONTSAME) As of the first five months of 2015, among 22.2 million breeding livestock counted at the end of 2014, some 18 million, or 83.2 percent, gave offspring. As for survival rate, a total of 18.549 million heads of young livestock is growing in healthy conditions, which is 2.25 million, or 14.3 percent, increase against the same of period of 2014. Natural losses of adult livestock stood at 345.5 thousand nationwide, increasing 119.5 thousand or 52.9 percent compared to the same period of the previous year. Out of these losses, 18.2 thousand were horses, 21.8 thousand--cows, 0.4 thousand--camels, 142.7 thousand--sheep and 162.5 thousand–goats. According to the late 2014 livestock census, there were 51 million 982 thousand 583 heads of livestock in Mongolia. Ulaanbaatar, June 12 (MONTSAME) In the first five months of 2015, 7340.7 thousand tons freight and 1161.5 thousand passengers (double counting) were carried by railway transport. Compared to the same period of the previous year, the amount of carried freight decreased by 432.7 thousand tons or 5.6 percent and the number of carried passengers decreased by 205.9 thousand or 15.1 percent, reports the National Statistics Office. The revenue from railway transport in the five months of 2015 reached MNT 142.7 billion, reflecting a decrease of 16.1 billion Togrog or 10.1 percent compared to the same period of 2014. In the same reporting period, 1,028.9 tons of freight and 214.2 thousand passengers (double counting) were carried by air transport. Compared to the same period of the previous year, carried freight decreased by 303.5 tons or 22.8 percent, and the number of carried passengers decreased by 35.7 thousand people or 14.3 percent. The revenue from air transport reached MNT 79.6 billion and increased by 2.1 billion Togrog or 2.7 percent against the same period of the previous year. June 12 (gogo.mn) During the state visit in Dubai, UAE PM Ch.Saikhanbileg has signed the Oyu Tolgoi Underground Development Agreement. After signing of this agreement Prime Minister plans on improving the Mongolia image in abroad. First of his actions towards bettering the Mongolia image will be the participation at the Economic Forum to be held in Saint Petersburgh next week, during which he is to meet with President of Russian Federation Vladimir Putin. Next on his agenda will be attendance at the investors summit to be held in USA by the end of June. According to Head of the Office of the Government S.Bayartsogt the trip will continue with attendance of the investors forum to be held in UK. June 12 (news.mn) -Is the party group's bid for a 34% stake in the Gatsuurt (gold deposit) supported? -Chief of the Democratic Party Group (DPG),B.Garamgaibaatar: After discussion, the DPG decided that we should own 34% in Gatsuurt. The Parliament has decided to use "Gatsuurt" (gold deposit). Today we are discussing about holding stocks. The government decided to own 34% in the way "the special payment on the use of natural resources", based on a deal with the company. The difference is, if we own 34% the Government will to give money (equal to 34% of investment) to the entity. In order to do this the Government will need to do many additional things, such as re-auditing and re-estimating the assets. That is why the Government made this optimal decision to take "the special payment on the use of natural resources", basically, it means that we will obtain 34% under the name of "the special payment on the use of natural resources". - What benefits will come by obtaining "the special payment on the use of natural resources"? - The Government presented the project as being economically viable: the main tax is USD 265.6 million, tax on natural resource is USD 139.4 million, "the special payment on the use of natural resources", is USD 53 million, income tax of entity is USD 57 million, and withholding tax is USD16.2 million. -Did the DPG discuss the "Economical Transparency Law"? - The "Economical Transparency Law" and "Economical Amnesty Law" have been presented to the Government. Currently the "Economical Transparency Law" is being discussed. After discussion of "Criminal Package Law", the Government will discuss "Economical Amnesty Law". Burged BAT-ORGIL, Secretary of the newly formed Mongolian National Labor Party (MNLP) answers to '9 Questions' of The Mongolian Observer. Can you tell us, in a few words, how does your reorganized and re-structured party differ from the previous one? First of all, it is live. Although registered in 2011 this party has been inactive ever since. Next, the main difference that sets the National Labor Party apart not only from its past modus operandi but also from all other political parties present in Mongolia is that we are a carefully designed institution that has core values and operates on principles and procedures rather than interests of various groups or loyalty to party or fraction leaders. Commitment to a long term vision and strategic planning for country's development based on professional expertise is another difference. What is the average age of your party members? Do you have people in the party who were members of other, say small or big parties in the country? Why have they changed their party affiliation to join your party? There are many people from different age groups, but the bulk of the party is formed by people of 35-45 years of age. They are professionals this nation has produced over the last 20 years. This is a group of people that usually does not get involved in politics, but social and economic situation forced them to start political career. There are some who used to belong to other parties, but now united here to realize their professional potential. The reason they joined the MNLP is that the current political establishment has depleted its capacity and is unable to change from within. Incumbent parties and their factions are tied by unhealthy bondages and deals that require too much effort to untangle. This energy should be rather spent more productively to develop our country. What does you party think of the present election system in the country? Political instability became a predominant feature of Mongolia and this affects our election system as well. Each elections the ruling parties tailor the law on elections to safeguard their own positions. Personally, I believe, they should be busy attending to more pressing issues like economy, healthcare, education and play fair for once instead of trying to stop the clock. Are you in favor of the majority or the proportional system of elections to parliament? Both systems have their own advantages and disadvantages. What is more important is stability and representativeness of voter's population. While more than one half of the country's population live in urban areas, the Parliament is not representative of this. Is your party going to run for the 2016 Parliamentary elections? Yes. Isn't this the goal of any political party? What are your expectations for your party for the 2016 election? How many seats do you think your Party might win in the 2016 Parliament? Even a single seat in the Parliament would be a success for a newly established party. As I have said, we have long term goals and patience to go the distance. We need to build our capacity and be ready when the time comes. How strong is your base in the rural areas? Rural population seem to make a difference in the election outcome, judging by past experience. Although there is very limited time, we are planning to establish solid footing in all areas. Of course, we have a plan, but what good will it make if we disclose it now? Is you party in favor or against the so-called automatic ballot casting and vote counting with the soеcalled 'black box', that has caused many concerns and arguments in the past? I cannot represent my party on the issue since we didn't discuss it yet so far. Logically, automatic ballot system should assist the counting. But when there is a need, why to be afraid of its manual confirmation? If there is nothing to hide, there is nothing to be afraid of. Finally, does your party think, that the elections in Mongolia are fair and open? Although there had been some incidents of irregularities there is no legal proof of grand scale organized election fraud, therefore, we cannot comment on this. Whatever the system is, we need to confidently overcome any obstacles to convincingly announce ourselves as worthy opponents. June 11 (International Republican Institute) Anniversaries are a natural time for reflection, and for Mongolia, its democratic anniversary falls just before its seventh national election cycle begins in earnest. The convergence of these events has resulted in a great deal of attention and discussion amongst political actors and citizens alike. There is a clear air of celebration here; in 25 years, Mongolia has transformed from a socialist Soviet satellite to a democratic, independent nation in a region that sorely lacks an orientation towards citizen-centered government. Still, there is a critical element of sober, reflective realism about the choices made over the past 25 years and the need to make difficult choices in the months and years ahead. Against a backdrop of decreasing citizen confidence in political parties, parliament and the government's ability to negotiate agreements that can turn the economy around, many here are taking another look at whether existing governing structures meet Mongolia's needs. Debate over the need to revise the separation and distribution of power amongst the executive and legislative branches is growing – many, both in and outside government, believe that the evolution of government bodies has resulted in political gridlock and an inability to make and implement programs on issues that matter to citizens – namely economic development, corruption and infrastructure. There are many discussions and workshops being held – which members of the relevant parliamentary working groups attend or participate in – indicating their interest to listen and engage in collective self-reflection. As an observer of this serious but impassioned debate, I am struck by the relative high level of engagement and reflection. Instead of simply whitewashing the process and highlighting gains and successes – the challenges, failures and cautionary tales of transition are being openly discussed and put on display. Beyond serving as a beacon of democracy in a region of autocracy, Mongolia's genuine introspection about its past and future should serve as an example to other countries that seek to continually evolve the quality and depth of democracy. Ulaanbaatar, June 12 (MONTSAME) The State House Friday hosted this discussion that may help in amending the law on international law. Co-organized by the Ministry of Foreign Affairs and the parliamentary Standing committee on security and foreign policy, the discussion brought together parliamentarians, experts from state organizations, NGOs and international organizations. Opening remarks were made by A.Tomor, a director of the Department of International Law at the Ministry of Foreign Affairs, and by J.Enkhbayar, a head of the Standing committee on security and foreign policy. The latter underlined that this discussion is held due to a requirement of joining multilateral treaties and establishing bilateral contracts as the external relations of Mongolia have been widening recently. If the new version is adopted, the regulation of a process of establishment of international contracts will be refined greatly, he added. After this, a presentation on the draft new version was made by N.Ankhbayar, a head of the Human Rights Section at the Department of International Law. June 12 (news.mn) Today, a discussion on renewed draft Law against domestic violence has been jointly organized by the President's Office and the Legal Standing Committee of the Parliament at the State Palace. Human Rights and Legal Policy Advisor to the President of Mongolia Ch.Unurbayar noted: "The Law against domestic violence was first approved in 2004. Somehow, it was better than not having the law at all. In the last 11 years, Law against domestic violence fulfilled its duty with certain achievements, but it doesn't meet today's public need. The law initiators said that this law is too general and weak to enhance the cooperation between the public organizations in preventing the domestic violence". After, Members of the Legal Standing Committee, MP L.Bold, MP D.Ganbat and other representatives of legal, human rights and judiciary organizations expressed their views on the renewed draft Law against domestic violence. Can freedom go online in Asia? June 11 (East Asia Forum) The Asian members of the Freedom Online Coalition (FOC) have announced their love of freedom and willingness to guarantee freedom online. But the reality is that there is a disconnect between stated ambitions and commitments, and actual policy. The FOC is a little-known outfit of 26 mostly European and North American states, but includes Japan, Mongolia and the Maldives among its members. Australia has also joined the FOC in 2015. FOC members are 'committed to working together diplomatically to voice concern over measures to restrict internet freedom and support those individuals whose human rights online are curtailed'. But it seems there is some confusion among the Asian FOC members as to what this means. In May 2015, Mongolia hosted the first FOC conference in the Asia Pacific. Mongolia is a liberal democratic country with a high level of internet penetration and social media use. It especially stands out considering the repressive nature of other post-socialist countries in Asia. But advocates of internet regulation liberalisation lamented the existence of a 'blacklist' of domain names in the country, as well as prominent cases of bloggers such as Ts Bat who was jailed for criticising government officials. Mongolia benefits from associating itself politically with the mostly-Western organisation. Both China and Russia, unilaterally and through the Shanghai Cooperation Organization (SCO), have placed severe limitations on freedoms online. As Mongolia is an observer of the SCO it has faced pressure from other SCO members to limit online freedom to consolidate internet polices of members and observers. Mongolia is worried about maintaining its political independence and may therefore value its role in the FOC as a means to counterbalance pressure from the SCO. The FOC also gives Mongolia a moral high ground to distinguish itself from China. Fellow FOC member Japan has seen an erosion of press freedom under Prime Minister Shinzo Abe. The 2013 Act on the Protection of Specially Designated Secrets (SDS) created barriers for journalists and citizens alike to report on activities designated as 'sensitive' by the government. Civil society groups opposed this legislation, but failed to exert enough pressure to stop it. Officials claim the law is necessary to enhance information sharing with allies and to stop diplomatically harmful leaks. But Reporters Without Borders downgraded Japan from 53rd to 61st (of 180 countries) over the past two years of the World Press Freedom Index after the ratification of the SDS Act. The Abe government has also appeared to censor critics in the media. In 2013, Katsuto Momii — a government loyalist — was appointed as president of NHK, Japan's national public broadcasting organisation. This compromised the objectivity of one of the most important media outlets in the country. As critical voices in mainstream media disappear, freedom of expression online becomes all the more important. To Japan's credit, the internet is far freer in Japan than in its Northeast Asian neighbours China and South Korea. China's 'Great Firewall' and South Korea's archaic National Security Act and Cyber Defamation Law clearly restrict freedom of speech online. Meanwhile, the SDS Act has not been used against bloggers or citizen journalists in Japan. As Japan brands itself as a 'mature maritime democracy', it has become important to associate itself with its ideological peers in the Western world. And, despite making overtures to Southeast Asia, Japan is eager to distance itself from the East Asian mainland. FOC membership gives Japan the moral high ground to criticise China in regard to its cyber governance. The Maldives is perhaps the most perplexing of the Asian members of the FOC. Unlike Japan or Mongolia, the Maldives is not an active member of the Western community, nor is it a mature democracy. It is not a country known for its advocacy of freedom online or offline. It ranked 112th on the 2015 World Press Freedom Index, and scored only four out of seven ('partly free') in the Freedom in the World 2015 index, where one is most free and seven the least. At some point, the Maldives might meet the high standards expected by most FOC members, but currently its membership is premature. The highest growth of internet users is likely to come from countries with authoritarian regimes. Various forms of authoritarianism are prevalent across Asia. Discussions of human rights and their extension to online human rights is thus of particular significance in Asia. By asking Mongolia to host the conference, the FOC surely was hoping to signal to other Asian countries that a discussion of human rights ought to include online rights. But not a single foreign journalist attended or wrote about the conference. 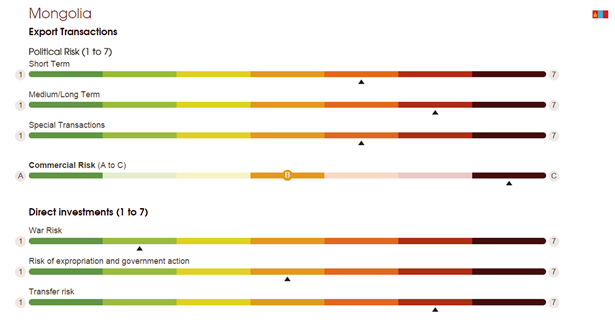 Will there be a contagion effect based on Mongolia's public modelling of online freedom? The answer remains unclear. Julian Dierkes is Associate Professor at the University of British Columbia's Institute of Asian Research. Trevor Kennedy, Melanie Schweiger and Christina Toepell are MA Candidates in Asia Pacific Policy Studies at the University of British Columbia. June 12 (news.mn) The Police Department for Economic Crime have been targeting a criminal group which has been involved in debasing the national currency by for MNT17 million. The suspected persons who have confessed their guilt, are two Mongolian citizens who the police have named as U and G.
During the investigation, police discovered that fake banknotes have been in circulation for the last 2-3 years. According to information provided, the suspects often used to copy 10,000 or 20,000 Tugrik banknotes onto A4 papers using a hi-tech copy machine, and added the holographic imprints using gimp pens. The fake money was then exchanged with real banknotes by taking taxis short distances, being served in night clubs, buying cheap items from kiosks. These criminal operations took place at night time, when it was dark and people were not so vigilant. People have been using these fake banknotes for some time despite the fact that they are distinctly different to the touch and look different under bright lights. June 12 (UB Post) The following is an interview with the Managing Director of Erdenes Tavan Tolgoi JSC (Erdenes TT), N.Nyamgerel, about timely issues. Erdenes TT sold 5.7 million tons of coal last year. This year, it's aiming to mine and export twice as much, specifically 11 million tons of coal. Currently, how much coal has been mined and exported? Coal export amount of last year doubled compared to 2013. Revenue from sales rose too. Specifically, revenue from sales increased to 400 billion MNT last year. In the first half of 2015, two million tons of coal was exported. Although the market trend will not improve, conditions for recovering and intensifying coal exportation in the second half has become consistent. Presently, the volume of stored coals ready for exporting has reached approximately 2.5 million tons. 1.5 million tons is stored in West Tsankhi (block) storage of Tavan Tolgoi (TT) deposit and the remaining in East Tsankhi. Soil stripping has been done and an additional 1.8 million tons of coal is ready for excavation at the East and West Tsankhi. In total, our company has got 4.3 million tons of coal ready, which amounts to 140.1 million USD. Last year, you said that supplying approximately 90 million USD would reimburse the debt to Aluminium Corporation of China (Chalco). Does that mean Erdenes TT has enough coal supply to settle the debt? We're paying off the 350 million USD loan to Chalco taken in 2012 with our coal supply at East Tsankhi. There's no problem for paying off the remaining debt balance. Around 200 million USD of the total debt has been paid with its interest of 40 million USD. Now, we're left to repay 175 billion MNT (nearly 94 million USD) to Chalco. How much does the company profit from a ton of coal? Will coal sales improve in the second half of this year? The competitiveness of our company's coal price isn't that bad. According to the report for the first half of 2015, the revenue for operations of the company is 34 billion MNT and the net profit amounts to 3.3 billion MNT. Despite the influence from currency exchange rate gap, achieving this amount of net profit means that future operations of Erdenes TT will be smooth. On the other hand, we don't see prospects of coal sales improving that much in the second half of 2015. Sales will most likely increase if our company offers appropriate coal prices so that it can keep its competitiveness in the market. There's a possibility that the Chinese market for steel will recover slightly. If the two parties of the agreement negotiate and lower the coal price specified in the agreement, sales are expected to increase. Australian company Macmahon is mining at the East Tsankhi of the TT deposit. When will the five year contract with Macmahon end? Macmahon had temporarily ceased operations at the mine. Has it restarted operations? Due to negotiation issues, Macmahon hasn't started mining at the East Tsankhi deposit and is still continuing to stall operations. Khishig Arvin Industrial LLC, Mera LLC and Mining National Operator LLC are working at the West Tsankhi deposit under their partnership, Mongol Miners. They have performed planned work within the normal range and mined 2.2 million tons of coal in the first five months of this year. Erdenes TT worked together with the Mongol Miner Partnership on reducing mining costs, and as a result, the mining cost decreased and is impacting positively on the competitiveness of our coal price. What measures is Erdenes TT taking to increase coal sales and repay the debt? The number of coal transportion trucks of purchasing companies has been increased to boost coal sales. Also, coal shipment is being done 24 hours a day and we're working with specific time schedule for customs clearance. Besides Chalco, what other companies do you sell coal to? Our company has established coal purchase and sales agreement with several companies. Sale operations are progressing normally in accordance to these agreements. We're supplying coal to Bayannuur Puushin Coal Industrial and Wulate Zhoungql Alion Resources Companies. Furthermore, we expanded our market and started selling coal to Russia. Erdenes TT accounted for 57 percent of the total coal exports of Mongolia of the first half of 2015. Do you think that Mongolia will be able to export 11 million tons of coal by the end of the year if it continues in this pace? Erdenes TT exported 1.8 million tons of coal so far this year, which is equivalent to 57 percent of Mongolia's total coal exports. Sales have dropped considerably due to the sudden price drop of coking coal in the Chinese market in the last two months. The company will discuss this with the purchaser sides and take all measures to ensure that sales rise even further. How many shipping companies are operating at the TT deposit? Currently, 1,589 shipping vehicles of three companies are shipping coal. In total, how many people are working at the deposit? How many of them are Mongolian workers? A total of 471 workers are doing mining work at the Tsankhi in Tsogttsetsii soum of Umnugovi Province. 33.1 percent of these workers are residents from Umnugovi Province and 60 people are from Tsogttsetsii soum. If you're interested to know the total number of employees of our company and subcontracting companies, it's approximately 2,998 people. Do you agree that the coal sector is facing the hardest period now? Price of coking coal reached its peak four years ago, but now, it has become three times cheaper. Under such condition, what difficulties and hindrances is Erdenes TT facing? I agree. One of the main factors causing the current economic difficulty in Mongolia is the dilemma in the mineral sector. More specifically, it's the price fall of minerals. Coal export played a key role for heightening the economic growth to 17 percent in the previous years, but now, it's become the opposite. Researchers stated that domestic factors are causing the decline in the coal sector's revenue rather than reduction in Chinese purchases or any other external factors. This issue should be considered carefully. Even so, China is still the biggest international coal market. To prevail in this competition, Mongolia will have to fight hard so that it doesn't lose opportunities to sell coal to others. How are urgent issues being resolved? It's more profitable to domestically process coal and export products with VAT. But, the primary action for our company during this time with low coal prices would be to increase supply by dramatically increasing the volume of production. This will lower cost per ton of coal and preserve the market. Also, the railway track for Tavan Tolgoi to Gashuun Sukhait route should be commissioned as soon as possible and a pricing proposal to lessen shipping costs through roads should be submitted so that Mongolia can compete with other countries in the Chinese market. We negotiated the conditions of the Chalco deal once again and made some changes. We managed to reduce the cost of coal production to a certain degree by liquidating Tsagaan Khad Customs Stockyard and establishing an in-border customs that transports coal straight from the TT deposit to Gashuun Sukhait Border Crossing. We're creating conditions for effective operations by opening the West Tsankhi deposit, increasing the volume of production, mining coals with lower costs, and supplying it to the Chinese market and other consumers besides Chalco. How are major projects related to coal washing factory, its water supply, railway and road coming along? The feasibility study for coal washing factory has been developed and approved. Although water issues have been determined, we've been cooperating with Nagata Engineering Company since 2013 on producing a technology that doesn't use water to process coal, but uses sand as part of a dry processing method. Trials, testing and research work have been completed. An advantage of this factory is that it doesn't use water and is friendly to the environment. There were talks about establishing an experimental industry for producing methane gas. How is this project progressing? Mongolia joined the International Methane Gas Cooperation in 2008. Mongolia cooperated with Ko Gas Corporation, a Korean state-owned corporation, and started research work on methane gas in 2013. During Speaker of Parliament Z.Enkhbold's visit to South Korea, a cooperation memorandum was signed with Ko Gas Corporation. A research work is presently operating with investments from this corporation. June 12 (UB Post) While smug politicians and officials are busy wrestling over Mongolia's most valuable mines, the country's economic and social woes continue to grow. The total state budget deficit by May 2015 had reached 347 billion MNT, according to the Ministry of Finance yesterday. State hospitals have announced that their supplies of medication are low, and Niislelin Urgu company has ended its concessional agreement with the Health Ministry and left the Yarmag Hospital project, which reportedly requires 44 billion MNT in financing for construction, infrastructure and equipment purchase. The Middle East respiratory syndrome (MERS) outbreak in South Korea is causing concern here in Mongolia, as travel to and from South Korea is very common. A state hospital official has said that Mongolia is currently unable to prevent a MERS outbreak or effectively contain it if it should break out in the country. All these issues were raised just last week, but state officials seem busy patting themselves on the back after the resolution of the Oyu Tolgoi dispute, as if they had done everyone a huge favor by sorting out the mess they made. There has been none of the progress promised by Parliament on the Tavan Tolgoi coal project. Speaker of Parliament Z.Enkhbold said over a month and a half ago that the Tavan Tolgoi project will be discussed in this session, but so far, no word has come out. Neither the Prime Minister, Speaker of Parliament, or the task group in charge of the Tavan Tolgoi project – the world's largest untapped coal mine, have been able to give definite answers as to whether or not the matter will be discussed by Parliament. The parliamentary task group working on the Tavan Tolgoi project, headed by MP L.Erdenechimeg, hasn't been able to give definite answers as to what will become of the project. Some members of the group have said that it hasn't met more than two times in the past month. MP L.Erdenechimeg stated last week that there are some differences in the Tavan Tolgoi investment agreement's English and Mongolian versions. The task group has reportedly appealed to the Ministry of Foreign Affairs to have the agreement inspected and translated. This action, to me, speaks volumes about the capability of L.Erdenechimeg's task force. Was there no one in the task group, devoted to managing the biggest coal mine in Mongolia, who could translate the document? At this rate, by the time the agreement's translation is ready, Parliament will be in recess a month from now. The squabbles surrounding Tavan Tolgoi, estimated to have 6.4 billion tons of high quality coal, has been around for many years. It's chosen investor, Energy Resources, one of the nation's biggest companies with an overabundance of political interests, is speculated as being one of the reasons for the delay in the Tavan Tolgoi project's fruition. The railroad for the mine, a 270 km track from Tavan Tolgoi to Gashuunsukhait, has been talked about for more than six years. First, the government couldn't agree on what kind of track gauge to use – the Chinese standard or Soviet standard (used in all railways in Mongolia). Now they are at the stage where they can't make up their minds on who should build it. So, not much luck there. The railway project was expected to bring about more than 1,000 stable jobs and provide fast and easy transportation for all the mines in the Gobi region, reducing the costs of mining companies and factories dramatically. Some local media speculate that the recent Oyu Tolgoi dispute settlement and the talk of launching the Gatsuurt gold mine by Speaker of Parliament Z.Enkhbold is a distraction so that politicians can split up the Tavan Tolgoi project. Parliament, no doubt, has a lot on its plate in this session, as it's preparing to make changes to the constitution, which will require an enormous amount of paperwork and debate. But it shouldn't wait around until the fall session to discuss the Tavan Tolgoi project due to the feeble reasoning that it has to be translated by the task force led by L.Erdenechimeg, a politician who is best known to the public as the MP who proudly posted a picture of her holding a dead rabbit on social media. Whatever the force may be behind the delay of Tavan Tolgoi, the mine belongs to the nation, and as such, representatives of the public (namely Parliament), should be enquiring as to what is happening to a project that can seriously change the economic game for Mongolia. Instead of waiting around for L.Erdenechimeg and her task group to sloppily prepare the Tavan Tolgoi project, Parliament should be taking the initiative to settle the matter fairly. Frankly, anyone who's been following the issue for years isn't expecting much from this project at this point. Which is extremely tragic and pathetic on the part of Mongolia's leaders. The sentiment that "not much can be expected from Tavan Tolgoi as long as politicians work for their own personal interests" has been echoed by many who care for the country. An agreement on the Oyu Tolgoi mine expansion project has finally been reached between Rio Tinto – which owns a 66% share in the mine via its Turquoise Hill subsidiary – and PM Saikhanbileg's government. The second development phase of this giant gold and copper mine estimated at USD 5.4 bn for underground operations will resume after having been frozen for two years due to a dispute around financing and tax payments. Moreover, there is hope that the Parliament soon gives its green light to develop the other big mining project, i.e. the USD 4bn Tavan Tolgoi coal mine. With political obstacles being progressively lifted in the mining project saga, Mongolia's investment framework could appear friendlier and thus raise investor confidence. A more attractive investment climate should reverse the sharp downward trend in FDI that has resulted from rising suspicion about the government's business stance. Mongolia would largely benefit from it as it much relies on FDI to drive GDP growth (expected to tumble to 4.4% this year from an 11% average rate in 2010-2014) and to finance a wide current account deficit forecast at 11% of GDP this year. This positive evolution with regard to exploiting Mongolia's largest mines are of particular importance in a gloomier context combining much lower commodity prices and slower Chinese demand, namely two crucial factors for Mongolia's economic performances. It remains to be seen whether this long-awaited mining deal is a clear sign of enduring political commitment towards investors that will survive future governments, the next test being the 2016 Parliamentary elections. Meanwhile, until Mongolia bears fruit from further exploitation of its giant mines, country risk will remain vulnerable to external shocks, pressures on foreign exchange reserves and local currency. 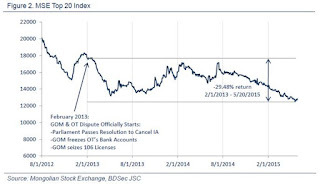 Therefore, Credendo Group's downgrade of Mongolia's short-term political risk rating from 3/7 to 5/7 in 2014 is not going to be reversed soon. Ulaanbaatar, June 12 (MONTSAME) First-stage loan has been tackled for an ongoing project on opening a credit line of export which is being co-implemented by the government of Mongolia and the Japan Bank for International Cooperation (JBIC) with cost of JPY 8 billion. The sides Friday established a contract on the first-stage loan's grant. The general export credit agreement was approved in June of 2013 with a two-year period. Although this agreement was established, the loan exploitation has not been good, said the Minister of Finance. So, the government of Mongolia asked the Japanese side to prolong the credit agreement for one year, and it has been accepted to utilize the loan until June of 2016. In accordance with the agreement, the JPY 8 billion loan will be given to Mongolian entities and enterprises through commercial banks for buying techniques, technologies and facilities. The JBIC officials express a hope that next agreements will be established, and that the intergovernmental Economic Partnership Agreement will expand the bilateral cooperation. Sumitomo Corporation (Head Office: Chuo-ku, Tokyo; President and CEO: Kuniharu Nakamura) in corporation with Komatsu Ltd. (Head Office: Minato-ku, Tokyo; President and CEO: Tetsuji Ohashi; hereinafter, "Komatsu") has closed a deal to export two Komatsu hydraulic mining excavators , worth approximately 500 million yen, through its Mongolian subsidiary Transwest Mongolia LLC (Head Office: Ulaanbaatar; CEO: David Turnbull) to Khishig Arvin Industrial LLC, a leading mining contractor in Mongolia. This is the first contract Japan Bank For International Corporation (JBIC) and Bank of Tokyo-Mitsubishi UFJ(hereinafter; BTMU) are co-financing under export credit line for Mongolian government, which was established in June 2013. The part of the financing which will be done by commercial bank, BTMU, will be covered by the insurance of official financial institution, Incorporated Administrative Agency, Nippon Export and Investment Insurance (NEXI). In 2010, Sumitomo Corporation supplied a large volume of Komatsu mining equipment for Rio Tinto's Oyu Tolgoi mine, one of the world's largest copper and gold mines, located about 550 kilometers from Ulaanbaatar, the capital of Mongolia. For the mining equipment supplied, Sumitomo Corporation has been providing product support services through Transwest Mongolia. Other coal, copper and gold mines are also being developed in the country, including the Tavan Tolgoi mine, in order to attract foreign investment. Due to economic conditions in Mongolia, however, local contractors are unable or unlikely to obtain loans, making it difficult to finance the purchase of mining equipment. In corporation with Komatsu , Sumitomo Corporation will continue to work on the sales of Komatsu mining equipment by utilizing export credit line for Mongolian government as appropriate. June 12 (Mongolian Economy) A group consisting of more than 20 representatives of the Business Council of Mongolia (BCM) visited Sopoco LLC, which produces solar panels in Mongolia. Mongolian entrepreneurs have organised this kind of business tour that visits other businesses for the first time in Mongolia. The business tour group met at Chinggis Square and headed to a factory residing in the first micro-district of Songinokhairkhan district. The Business Council of Mongolia's energy and environment working group initiated this study tour and plans to organise it every month in the future. "There is a fair amount of wind and hydroelectric plant construction going on in Mongolia. It's only being mentioned during meetings, which is not enough when we're trying to show this to our members and let their creative juices flow. This event is being organised to do just that," said the group's leader, Senior Program Officer in the Green Growth Planning and Implementation Division of the Global Green Growth Institute, Ts.Bulganmurun. The factory's lobby was adorned with colourful flowers when the group arrived. It resides in the same building as its parent company Shilen Khiits LLC, which produces glass and glass products. The group's official study tour began from this location. Sopoko LLC is manufacturing solar panels and a variety of solar powered electrical equipment for the fourth year. They manufacture 250- 260 watt solar panels for construction works and power stations and 150 watt solar panels for herders. In addition, they are producing 73 watt solar screens dedicated only to power lights and televisions in Mongolia. Price wise, it is a little higher than imported solar screens because the raw materials are purchased from China. For example, the 150 watt solar panels are being sold for MNT 400 thousand. However, they maintain that it is higher quality. Their target market is herders' camps. They take orders for electrical appliances such as 12 volt refrigerators, televisions and kumis pistons, and the "Camp Ger" national brand was established. "Mongolia's energy sector is moving toward green energy. New technologies should be introduced rapidly," said T.Chinges, Deputy Director of Sopoko LLC. The company has introduced Japanese and German technologies. Aside from the solar panel factory, our group stopped at Shilen Khiits LLC's factory. This factory produces 1,320 tonnes of glass per year to supply the domestic market and provides 40-50 percent of the country's consumption of glass. After that, the first ever study tour of members of the BCM came to an end. The participants told the working group of the council that these kinds of study tours must be organised again, and many participating members have requested to host the next one. Domestic companies will have the opportunity to expand their operations and market by organising these types of study tours. On the other hand, the organisers said that it must serve the purpose of making the Mongolian market easier to access from abroad and attract investments. June 9 (Worldwatch Institute) The first initiative of its kind in Asia, Gobitec is a novel effort to tackle energy security through expanded renewable energy development and regional cooperation in one of the most energy-consuming parts of the world. The project aims to harness solar and wind power from the Gobi Desert and to distribute it to Northeast Asian countries, specifically high-demand areas of China, Japan, and South Korea. In a region highly dependent on foreign energy supplies, the proposed Gobitec project offers a new alternative: energy security from renewable sources. Gobitec hopes to produce clean, renewable energy (mainly solar and wind) in the Gobi Desert and to deliver it to high-demand areas of Northeast Asia. According to a recent study by the U.S. National Renewable Energy Laboratory and the Mongolian National Renewable Energy Center, the Mongolian side of the Gobi Desert has an estimated total renewable energy capacity of2,600 gigawatts (GW) per year. With 270 to 300 sunny days and multiple sites with high-quality wind potential, Mongolia is ripe with opportunity for renewable energy generation. The Gobitec project would work in tandem with a separate, but related, project—the Asian Super Grid—which aims to connect the national grids of Mongolia, China, South Korea, Japan, and the Russian Far East with high-voltage direct current transmission lines through a regional energy distribution system (see Map). Given current plans, Gobitec will have an installed capacity of 100 GW of solar and wind power and distribute it through the Asian Super Grid. At each node, countries will be responsible for disseminating electricity through their own interconnection lines. Since Asian Super Grid countries have different peak electricity demand due to both seasonal differences in load curves and variations in time zones, Gobitec is expected to smooth supply and demand balance among the different countries. A proposed map of Gobitec connected via the Asian Super Grid. Source: Hanns Seidel Foundation Korea. Among the many benefits of Gobitec are increased flexibility in renewable potentials in grid systems, increased national energy security, regional cooperation, and reduced carbon emissions. The project's potential impact on Mongolia is particularly tremendous. Experts estimate that the country would gain 880,000 energy-related jobs, helping to alleviate poverty and diversify the economy. Moreover, capital investments in Mongolia would lead to improved infrastructure while simultaneously reducing air pollution and other environmental problems. However, massive infrastructure projects are inherently complex and expensive, and Gobitec is no exception. Project costs are estimated at around US$293 billion, and annual maintenance costs are estimated at $7.3 billion. Gobitec will need to attract sufficient foreign direct investment. This implies the need for political and economic stability in the region, as well as for policymaking by countries to improve market access, intellectual property rights for technology transfer, and reduce regulatory barriers. And while the renewable energy technologies needed for Gobitec are already available, uncertainties remain regarding the engineering of the long-distance high-voltage direct current lines planned for the Asian Super Grid. Even if Gobitec were to materialize, some experts remain skeptical about how much of an impact it will make on the energy composition in the region. Based on a 2014 report compiled by five Northeast Asian energy organizations, the total domestic generation capacity is expected to reach 1,869 GW in China, 296 GW in Japan, 159 GW in South Korea, and 1.7 GW in Mongolia by 2030. While accounting for expected energy demand and import dependence, the report estimates that China, Japan, and South Korea will supply 4.0 percent (75 GW), 3.4 percent (10 GW), and 9.4 percent (15 GW), respectively, of their total capacity from Gobitec. These moderate increases in renewable energy demonstrate that Gobitec may not replace, but rather just complement, existing sources of energy. These challenges do not take away from the overall significance of Gobitec. If successful, the project will help to lessen anxieties about energy security in Northeast Asia. Gobitec represents an innovative outlook toward problem-solving in an increasingly complex world and can provide a stepping stone to greater regional cooperation. June 12 (UB Post) On June 9, Leather 2015 Consultation was held, announcing that deep-processed hides are now ready for export. There are 35 leather processing factories and around 200 sheepskin and leather clothing factories nationwide. During the consultation, experts emphasized that Mongolia is ranked in the middle by its leather tanning technology. The consultation attendees underlined that technology leading the globe needs to be introduced to the Mongolia leather sector. Leather is burned in order to be processed, leaving great waste. Industry officials noted that advanced technology that processes leather without burning is required in Mongolia. Leather is processed through 40 stages for 20 days. Mongolian leather is durable and its wear is longer compared to other countries, that's why Italy, Spain, Turkey, and South Korea have begun purchasing leather from Mongolia. Leather producers expressed that the sector's drying and coloring technology is behind, and added that technological upgrades can be made through financing from the bonds of leather restoration projects. National Advisor on Agriculture and Rural Development of Asian Development Bank (ADB) S.Davaajav said, "In 2010, ADB provided concessional loans to Mongol Shevro, Darkhan Nekhii, and Darkhan Minj companies to increase their production and work force. The second stage of the project will start soon. "ADB invested over 10 million USD in these factories, and implementation of the project has improved factory capacities. In particular, Darkhan Minj produces fur from sheep skin, while Darkhan Nekhii processes cattle skin." Implementing projects with these three companies will advance their technology by 70 to 80 percent. Therefore, the opportunity for exporting deep-processed hide has been opened up. A Spanish specialist will come to Mongolia to test new possibilities. Mongolian scientists have begun conducting research on shortening the steps of leather processing and mitigating waste. They underlined that leather processing should be efficient, ecologically-friendly, and healthy for the human body. The consultation participants discussed the sector's current conditions and further plans. Producers highlighted that even though leather didn't reach brand level, Mongolia is now able to compete with its third neighbors with its leather products design. The consultation was jointly organized by the Ministry of Industry, Animal Protection Fund, Agriculture and Rural Development Project of ADB, Employment Federation and Leather Industry Association. June 13 (CRI English) A freight rail service linking the northeastern Chinese city of Harbin with the Germany city of Hamburg has been launched. The new service, which passes through Mongolia and Russia, will deliver goods to Europe twice as quickly as maritime deliveries. Gao Zhanguo with Heilongjiang's department for Silk Road Economic Belt projects says the new rail link has obvious benefits. "The China-Mongolia-Russia corridor is the biggest one among the six land corridors along the Silk Road Economic Belt. It runs in a core area linking Russia, Mongolia, Japan and South Korea. It stretches across Eurasia from the Pacific Ocean to the Baltic Sea. The rail service can make freight transport more convenient." It's expected the line is going to carry some 4-billion yuan worth of freight every year. The launch of the Harbin-Hamburg freight line comes just days after the launch of freight train services between Xinjiang's capital, Urumqi and Moscow. Few days back S.Unen, Head of the Water and Sewage Authority warned residents and officials on dumping untreated waste water into Tuul river due to threats of outages at the aged waste water treatment facilities of the city. After that warning B.Badral, Head of the Mayor's Office and General Manager, made an announcement that there is no need to do restrictions at the water supply of the city and dumping the untreated water into the Tuul river. In order to make the matters clear we approached Senior Engineer at the Waste Water Treatment Facility Ts. Bold. -Could you update on the latest development of the repair works at the facility? -As a result of the talks with the UB city General Manager the facility repair works will start at 3AM on June 13. This means the water supply for the city will be restricted, so that the waste water collected at the facility will be reduced to the acceptable level for repair works. -There were two differing announcements made in regards with water supply restrictions and the dumping of the waste water untreated? -Waste water is to be treated with mechanic method that treats waste 40-50 percent. At the facility we usually do two types of treatment: mechanic and biologic. The waste water facility receives 150 thousand cubic meters of waste daily. Any repair works will require the water supply restrictions in the future. -Does it mean water is not treated 100 percent? -Yes. Waste water is not treated 100 percent. But the dumping of the 50 percent treated waste water is inevitable. -How long will the repair works proceed? -Repair work will start on Saturday morning and continue to Sunday evening. We plan on 48 hours repair works. -How much will it help if the residents will restrict their use of water? - It will help us a lot, If the residents will restrict their use of water. -Is there a guarantee that this repair will solve the problems? -There is no guarantee at all. This repair is just an emergency action to stop the big catastrophe. We are to do only small repairs to fill the holes and damages. This time repair work will only solve the tiny portion of a bigger problem which is to prevent outage of the facility, until the issues of new Waste Water Treatment Facility Development is solved. There is no guarantee that Tuul river will be safe from dumping of the untreated waste water. June 12 (gogo.mn) Waste Water Treatment Facility repair works will start at 3AM on June 13. 10PM on June 12 to 08AM on June 13, water outage will be done in Ulaanbaatar city`s housings due to the facility repair works. The water supply for the biggest industries will be fully stopped for the weekend. Therefore, authorities warned residents to reserve water for their consumption and to restrict their use of water during the weekend. June 12 (news.mn) This year many events and performances will take place for the Naadam celebrations. One of them will be the famous Mongolian opera "Uchirtai Gurvan Tolgoi "by D.Natsagdorj. The performance will be Interesting as the opera will be performed on Chinggis Square. The event will take place on 10th July at 21.00pm. The chief executive of the Opera and Dance Theatre, Ch.Munkhzul gave information. The Naadam Celebration Program is including "Uchirtai Gurvan Tolgoi Opera"; and it very nice that it is going to be performed on Chinggis Square. "Uchirtai Gurvan Tolgoi Opera" has gone through many changes on the stages since the great writer D.Natsagdorj wrote it. Initially it was a dramatic play then a musical play; and now it became opera. This is the first national opera of our theatre. This year, marks its 65th Anniversary as an opera. Also, this opera is a real national favourite. Therefore, we are organizing this special event on Chinggis Square in order to perform for as many people as possible. In the theatre, there is a limited number of seats. By performing on an open square, many more people can see it! The Opera and Dance Theatre has a total of 500 seats. We wanted to show our performance to more many people. That is why decided to build a stage on Chinggis Square. The audience will see a real spectacle. For the performance at 10th July at 21.00 pm, we will prepare 5000 seats on Chinggis square. We hope that audiences will have a comfortable night and be proud to watch the National First Opera. Can you tell more information about the selection of main roles? We decided to make a special selection for main four roles in the opera - Yunden, Nansalmaa, Khorolmaa, and Balgan in Mongolia. We are choosing the very best! Also, they will have a great opportunity to show their ability in front of so many onlookers. EN - European Parliament - Formal sitting: Address by Tsakhiagiin Elbegdorj, President of Mongolia in the presence of Martin Schulz, European Parliament President - English Version - 09.06.2015 - European Parliament, Strasbourg. Tsakhia Elbegdorj, President of Mongolia: "Mr President, I would like to begin with something simple: thank you. Thank you, Mr President, for inviting me. Thank you, Members of the European Parliament, for giving me this opportunity to share my views with you, the distinguished representatives of 28 sovereign states of this great continent – Europe. I am the youngest of eight sons. For generations, my family lived as nomadic herdsmen in the western highlands of my country, in the ranges of the Altai Mountains. My mother and father never dreamed that, one day, their youngest son would speak from this respected podium to the most caring hearts of democracy: the European Parliament. But this is not about me. I am here to speak for my people about my country. I am proud of my motherland, Mongolia. I am proud of our history, our culture, our traditions and the natural beauty that surrounds us. But most of all I am proud of our spirit and our values. The brief story of my country's modern history and our journey to democracy will sound familiar to many of you. In the early 1920s, Mongolia came under communist rule, which lasted for seven decades. During the Stalinist purges one out of every six adult men was killed. More than 700 Buddhist temples were burnt to ash. The foreign and domestic agents of the communist experiment targeted the very spirit of our nation. But they were not destined to win, not destined to last forever. In the end, our will to live free prevailed. After many years, our defining moment finally arrived. On the cold morning of 10 December 1989, we organised the first unauthorised public street meeting in our capital city, Ulaanbaatar. I was fortunate enough to be chosen by my fellow democracy fighters to moderate that historic event. 'We have remained silent for a long time: this is our time to work; this is the time for reform' – these were my opening remarks. That morning, we demanded our rights – of freedom of assembly, of speech, of religion, and freedom of the press. We demanded the right to create a multiparty system, conduct democratic elections, and begin market reforms. It was the beginning of my country's journey to liberty, justice and openness. That was a tough journey to embark upon. During that time, our neighbour – the Soviet Union – was intact. Its grip and control was still tight, powerful and overwhelming. In our other neighbour's capital, the Tiananmen Square massacre had happened. Its shockwave was still fresh and influential. In Mongolia, the old regime was stubborn. The old mindset was strongly resistant to change. We organised many meetings, demonstrations and hunger strikes. We tried to eliminate every reason for violence. We always called for compromises, for peaceful solutions. Indeed, Mongolia's democratic revolution was totally peaceful. Not a single shot was fired. Not a single window was shattered. Not a single drop of blood was shed. A month from now, Mongolia will celebrate the 25th anniversary of its first full democratic, multiparty election. Since that historic day on 29 July 1990, we have had full-scale democratic elections for parliament seven times and for the presidency six times. And since that day, a quarter of a century ago, we have transformed from a dictatorship to a democracy, from being one of the most isolated, closed communist regimes in the world, to one of the most open. Today we have a dynamic market economy, and a vibrant, plural, creative society. Our per capita GDP has increased more than 20-fold. Our private sector now produces more than 80% of our gross domestic product. I want to talk about some of the virtues at the core of our young democracy, virtues we hope to strengthen in the coming years through cooperation with our partners in Europe and elsewhere. Individual freedom is the cornerstone of our democracy. Mongolians love freedom because we have earned it through hard work. Government in a free country is not the property of any specific group of people. In order to sustain a healthy society, we must keep nurturing and challenging it every day. The beauty of freedom is that it is a learning process. It is the healing system of human society. We can make mistakes, but mistakes will not cost us our lives, as in a dictatorship. That is why we love freedom. Mongolia is among the top countries in the world in terms of the number of media tools used per capita. We have only three million citizens, but it feels like there are three million journalists too! (...)"
June 12 (president.mn) President of Mongolia Tsakhiagiin Elbegdorj arrived in Ulaanbaatar yesterday after having paid an official visit to the European Parliament, Strasbourg, France, on June 8-10, 2015, upon the invitation of the President of the European Parliament, Mr. Martin Schulz. The European Parliament headquarters in Strasbourg, France, and is made up of 751 Members elected in the 28 Member States of the enlarged European Union. On the sidelines of his visit, President Elbegdorj delivered a speech during a plenary session of the European Parliament, which was the first ever speech of the President of Mongolia to the European Parliament. Moreover, President Elbegdorj held meetings with the President of the European Parliament, Mr. Martin Schulz and the President of the European Commission, Mr. Jean-Claude Juncker respectively and exchanged views on the current bilateral relations and further opportunities for enhancing cooperation between Mongolia and the European Union. June 12 (UNESCO) Mongolia will pursue efforts to support successful democratic transitions and build tolerance through education, culture, freedom of expression and intercultural dialogue, affirmed the Minister of Foreign Affairs and Chairman of the National Commission for UNESCO Mr Lundeg Purevsuren during a meeting with Director-General Irina Bokova at UNESCO Headquarters on 12 June. The Minister expressed strong appreciation for UNESCO's cooperation with Mongolia, stressing that education is the most valuable investment for the future and underlining the country's resolve to contribute to the advancement of education for democracy. This follows the adoption of a UN resolution in November 2012, put forward by Mongolia when it held the presidency of the Community of Democracies, encouraging Member States to integrate education for democracy and human rights into the curriculum. The Minister drew attention also to the recent creation of a Mongolia International Cooperation Fund aimed at sharing the country's experience in democratic transition, noting recent cooperation with Myanmar on training public officers in the field of constitutional and election laws. He also highlighted the emphasis the country is placing, through a new Public Diplomacy and Communications Department within the Ministry of Foreign Affairs, on the promotion of both cultural heritage and modern art forms, as well as people-to-people exchanges. The year 2015 marks the 25th anniversary of Mongolia's transition to democracy. The Director-General praised the breadth of Mongolia's contribution to UNESCO, ranging from its leadership through the United Nations Literacy Decade, its active promotion of education for democracy, which relates directly to fostering global citizenship among youth, and its commitment to the safeguarding of the country's rich tangible and intangible cultural heritage. She also commended the Minister for the recent organization of the Freedom Online Conference in Ulaanbaatar, attended by the Deputy-Director General Mr Getachew Engida. Through inclusive economic development, intercultural dialogue and support to democracy building and governance, Mongolia's experience provides key lessons for taking forward the post-2015 development agenda, concluded the Director-General. In recognition of strong ties between Mongolia and UNESCO, the Minister confirmed that President Tskhiagiyn Elbegdorj would participate in the Leaders' Forum of the 38th General Conference and conveyed the President's decision to decorate the Director-General with Mongolia's highest state honour awarded to foreign nationals, the Order of the Polar Star. Ulaanbaatar, June 12 (MONTSAME) Mongolia's Minister of Foreign Affairs L.Purevsuren and Mr Laurent Fabius, the Minister of Foreign Affairs and International Development of France, will receive the Paris-based diplomatic corps, French business leaders and cultural figures on Friday today at the Domaine de La Celle Saint-Cloud in frames of the Mongolia-France Cultural Days, reported June 11 the French Ministry of Foreign Affairs. This event, for which the Mongolian FM is visiting this country, will take place June 11-14, being organized by Mongolia's Embassy and Flag-France Renaissance, as a part of a process aimed at giving new momentum to exchanges between our two countries, as the 50th anniversary is being celebrated of the establishment of diplomatic relations between France and Mongolia. A delegation of Mongolian artists, musicians and art masters will present a comprehensive program of Mongolian traditions to show the diversity of our culture and exceptional expertise. Washington, D.C., June 9, 2015 (Rumsfeld Foundation) - Leaders from business, government, academia, and civil society will convene later this month in Ulaanbaatar, Mongolia at a two-day meeting to discuss key issues and challenges facing the Eurasia region. Hosted by the Rumsfeld Foundation in partnership with the Central Asia-Caucasus Institute at Johns Hopkins University, the 2015 CAMCA (Central Asia-Mongolia-Caucasus-Afghanistan) Regional Forum, will be held on June 20th-21st. The second CAMCA Regional Forum will explore ongoing developments in the region and beyond. The Forum will include high-level speakers, plenary discussions, as well as three parallel Dialogue sessions. The themes of these Dialogues will be "CAMCA's Evolving Place in the World Economy," "Foreign and Security Outlook of CAMCA in 2025," and "Unlocking the Potential of CAMCA's Human Capital." Within the framework of each Dialogue there will be conversations on key topics relevant to the theme, featuring alumni of the Rumsfeld Fellowship Program, alongside invited officials and experts from Mongolia, the CAMCA region, and the broader international community. Keynote remarks will be provided by Ambassador Zalmay Khalilzad, President of Gryphon Partners LLC and former U.S. Permanent Representative to the United Nations, U.S. Ambassador to Iraq and Afghanistan, and U.S. Special Presidential Envoy to Afghanistan. "Our Foundation looks forward to hosting the upcoming 2015 CAMCA Regional Forum in Ulaanbaatar. We hope it will provide an opportunity for continued dialogue and interaction among the rising leaders in this most important region," said Donald Rumsfeld, President of the Rumsfeld Foundation. The CAMCA Regional Forum is a non-political and non-partisan entity established to promote region-wide discussions on means of advancing economic growth and development in the heart of Eurasia (Afghanistan, Armenia, Azerbaijan, Georgia, Kazakhstan, Kyrgyzstan, Mongolia, Tajikistan, Turkmenistan, and Uzbekistan). It promotes this goal by fostering dialogue and interaction among rising young leaders from various sectors in the 10 countries of the region, as well as with international leaders and stakeholders. The CAMCA Regional Forum has evolved out of the Rumsfeld Fellowship Program at the Central Asia-Caucasus Institute at Johns Hopkins University's School of Advanced International Studies, which has been bringing rising young leaders from the region to Washington, D.C. since 2008. As of June 2015, over 120 professionals have completed the Fellowship. For more information about the Rumsfeld Foundation, please visit www.rumsfeldfoundation.org or the Foundation's Facebook page. For more information on the Central Asia-Caucasus Institute at Johns Hopkins University, SAIS, please visit www.silkroadstudies.org. June 8 (Eurasia Daily Monitor Volume: 12 Issue: 106, The Jamestown Foundation) Despite sharing similar desires to become transit corridors between Europe and Asia, Kyrgyzstan and Mongolia have been unable to prioritize new railway projects, whereas Kazakhstan is moving far ahead by building new railways connecting Chinese, Iranian and Russian rail networks. With the newly built second railway connection on the Sino-Kazakhstani border in 2012 and the Kazakhstan-Turkmenistan-Iran railway link in 2014, Kazakhstan is developing into an important transit hub and is diversifying its markets in natural resources and agricultural products—especially wheat (see EDM, May 20). Kazakhstani railways, for instance, now serve as critical rail links between the southeastern Chinese city of Zhengzhou and Hamburg, Germany, as well as the Chinese inland city of Chongqing and the western German city of Duisburg by providing a shorter, quicker and cheaper transportation route (China Daily, July 19, 2013; Xinhua, April 8, 2014). In contrast, new railway projects have been delayed in Bishkek and Ulaanbaatar, mostly because of conflicting local agendas. For many years, China and Uzbekistan have supported constructing a new 270-kilometer railroad linking the Chinese city of Kashgar (Kashi) to Andijan in Uzbekistan, via southern Kyrgyzstan (see EDM, February 13, 2014). However, political and social unrest in 2005 (Uzbekistan) and 2010 (Kyrgyzstan) has prevented this railway project from being realized. Furthermore, several other obstacles continue to stand in the way (Slovo Kyrgyzstana, March 31; Vecherni Bishkek, February 25). For one thing, the leadership in Bishkek is wary of this east-west railroad, fearing it could deepen the conflict between the Kyrgyz Republic's Uzbek-dominated south and the rest of the country. The government worries the railroad would disproportionately increase economic benefits to Kyrgyzstan's secessionist southern provinces (oblasts), thus providing them with greater leverage against the center. Secondly, the railroad would overwhelmingly benefit China and Uzbekistan; and Bishkek perceives both these countries with suspicion. Specifically, thanks to the east-to-west railroad through southern Kyrgyzstan, China would gain an additional inland route to Eurasia, South Asia and, most importantly, the Middle East. Moreover, the railway corridor would provide China with greater access to gold, aluminum and iron ore deposits in Kyrgyzstan's Naryn and Jalalabat provinces. For Uzbekistan, the new railroad is crucial for cementing its strategic partnership with China, given Tashkent's complicated relations with Europe, Russia and Kazakhstan as well as war-torn Afghanistan (see EDM, January 14). Thirdly, the railroad project would increase China's influence in Kyrgyzstan by facilitating Chinese mineral extraction projects and the influx of illegal labor, as well as raising Beijing's political and economic leverage in Central Asia. Based on these objections, Bishkek desires to prioritize a north-south link instead, which would meet Kyrgyzstan's domestic economic and political objectives. However, this link is much more costly, and none of the potential investors (e.g., China and Iran) are interested. And against the background of its current socio-economic challenges, Bishkek is running out of options. Therefore, it has already begun to reconsider the Chinese offer while trying to assuage domestic concerns with promises of increased transit fees, the creation of local employment opportunities, 51-percent Kyrgyz ownership of the railroad on Kyrgyzstani territory, as well as a pledge to build wheels-changing stations in Kyrgyzstan (Slovo Kyrgyzstana, March 31; Mtc.gov.kg, February 12; China Daily, January 21). Similarly, large-scale railway development is also a hot topic in Ulaanbaatar. Debates in Mongolia have revolved around the priority over different routes, gauge standards (whether Russian broad or Chinese narrow), and the ownership of new railways (APM, February 12, 2013; Newsweek, April 13, 2015). Three potential new railway routes are currently under consideration: 1) several short railways, ranging from 18 km to 267 km, to link major mineral deposits in the south to the Chinese rail network; 2) a long domestic railway (1,800-km) linking these mineral deposits to the Trans-Mongolian Railway and to the Russian Trans-Pacific Railway; and 3) a railroad linking mineral deposits in the north to the Trans-Mongolian Railway and, potentially, to the Russian rail corridor through Tuva. All direct short rail links to China would be built on the Chinese standard gauge; while the other two routes would be constructed in the Russian standard gauge. But disagreements over these routes, the gauge widths, and ownership schemes have stalled further development. Those in Mongolia opposed to direct rail links to China argue that these transit lines would benefit only a few mining companies, increase the country's dependency on the Chinese market. Moreover, they contend, such links would make Mongolia a natural resource backyard for China and even facilitate a Chinese demographic influx. Therefore, in order for Mongolia to maintain the policy of "one country, one rail standard," to develop domestic infrastructure and industry, and to diversify the country's export destinations, many in Ulaanbaatar also argue the need to prioritize the building of a long domestic northern railway line. The parliament had prioritized these domestic routes in 2010 and again in 2012; but these projects are costly and lack support from foreign investors. 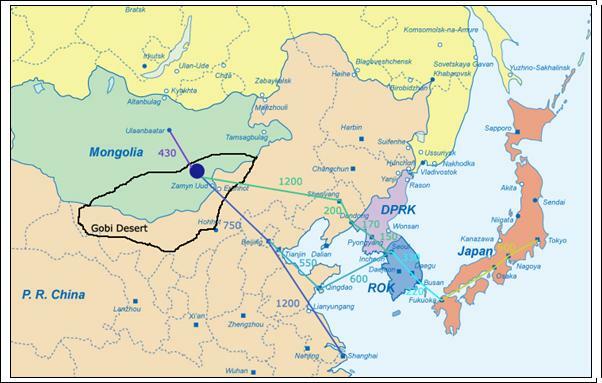 As a result, the government has already offered Chinese Shenghua Energy the rights to build an 18-km rail link and is about to finalize the rights to build another connection, which would join the major coking coal deposit at Tavan Tolgoi to the Chinese rail network (Unuudur, April 22, 2015). Railway debates in Bishkek and Ulaanbaatar, the capitals of two fledgling democracies in Inner Asia, will likely persist in the coming years, particularly if political and economic factions continue to be linked to geopolitically based fears of China. But politicians in both capitals are running out of options, given their countries' increasing foreign debt, vulnerability to international commodity markets, and growing threats of being left out of emerging transcontinental railroad networks. Therefore, both Mongolia and Kyrgyzstan are acquiescing to Chinese investment offers through Beijing's Silk Road infrastructure development projects. Nonetheless, these railway debates will continue to be complicated by Russia's own economic and geopolitical interests in the region. Latest Action: 06/01/2015 Referred to the Committee on Foreign Relations. Congratulates the people and the government of Mongolia on the 25th anniversary of the first democratic elections in Mongolia, to be celebrated on July 29, 2015. June 13 (KpopStarz) South Korea and Mongolia are celebrating their diplomatic anniversary, K-pop style. On June 13, three K-pop groups will perform in Ulaanbaatar, Mongolia. Girl groups Mamamoo and Crayon Pop will perform alongside the boy band K-Much and other Korean and Mongolian acts. The event was planned by the South Korean Embassy in Mongolia to foster ties between the two countries. The event is a commemorative concert in honor of the 25th anniversary of diplomatic ties between the two Asian nations. This is the first time that the three K-pop groups will perform in Mongolia. South Korea's Foreign Ministry revealed that Korean dramas and music is popular in South Korea. "In Mongolia, most South Korean dramas record high ratings and there are tens of thousands of members in the fan clubs of K-pop groups," the statement reportedly said. "The event this time is expected to help further promote the development of exchanges and friendly relations between the two nations." Mamamoo is four-member female vocal group will release their latest song "Um Oh Ah Yeh" on June 19. KpopStarz recently interviewed the quintet. Read the full interview HERE. Crayon Pop is a five member girl group known for hits like "Bar Bar Bar." They released the song "FM" on March 27, 2015, after premiering the song at SXSW 2015. K-Much is a four-member male idol group under the same label as Crayon Pop. The group debuted in January 2014, and last released the song "Fish In A Fishbowl" on March 6. Over 2,700 people are expected to attend the concert. June 12 (UB Post) In 2013, local experts projected that due to climate change Mongolia will become increasingly dry and hot in the summer and experience greater snowfall in the winter. Owing to shifting climatic patterns, rates of soil erosion are expected to rise and droughts to become longer and more frequent. What makes these future calamities all the more alarming is that Mongolian rangeland is already at risk. It's no secret that soil erosion, desertification, and threats from natural disasters—like dreadful dzuds, harsh winters followed by droughts—represent serious challenges to the herders who lead pastoral lifestyles. These factors, combined with short growing seasons and high livestock concentrations, have already led to increased rates of animal mortality and greater vulnerability of the nomadic population. According to a 2008 study published in the scientific journal, Rangelands, Mongolian pastureland has seen a 20to 30 percent decrease in productivity over the last 40 years. A February 10, 2015 piece in The Huffington Post stated, that "over the course of the past 30 years, approximately a quarter of the country has turned to desert, with around 850 lakes and 2,000 rivers having dried [up]." But how and why has the state of the steppes deteriorated so markedly in recent decades? Local and international experts alike believe that the worst environmental impacts have occurred since Mongolia, once a Soviet satellite state, embarked on a profound transition to democracy in the early 1990s, following its independence from the former USSR. Dr. Ian Hannam, a renowned soil conservationist, argued in a 2010 book chapter, "Human Dimensions of Soil and Water Conservation: Mongolia," that the lack of regulation of pastureland following the choppy transition to a market economy greatly contributed to the destruction of much of Mongolia's crucial forage cover. De-regulation and ineffective governance coupled with social upheaval led to an increased human impact on the steppe. Spurred by the sudden absence of government employment and faced with urban destitution, the early 1990s witnessed a large migration of city-dwelling Mongols to the countryside. At the same time as the inexperienced urbanites re-adopted the herding lifestyles of their grandparents or great-grandparents, post-Soviet reforms resulted in the removal of a social safety net for herders. Many scholars, including Dr. Marcus Taylor of Queens University, argue that in the absence of socialist-era negdels (publicly contributed and managed herds), insufficient government support for herders—especially in times of hardship—resulted in both negative social and environmental impacts. The unregulated commercialization and stratification of the livestock industry over the period of privatization led to increased income inequality, rural poverty, and rates of rural-urban migration. Formerly able to borrow cattle or goats against the unions in times of need, many pastoral families hit hardest by extreme weather events in recent decades were forced to work for petty wages under the employment of growing herding operations or seek additional means of income in urban centers. A number of environmental consequences have accompanied these continuing social trends. In part due to the increased familial need for as large a buffer as possible between survival and destitution, the average herd size has increased which, in turn, has caused serious rangeland degradation. Additionally, as tens of thousands of herders seeking additional economic means have moved to semi-established housing near urban centers, they've brought along their livestock, or at least the remnants of their herds. The deteriorating effects on the land are immediately obvious; vast swathes of muddy, trampled, and barren meadows radiate outward from town and village centers. Unsustainable concentrations of cattle, sheep, and goats have greatly intensified land use and affected the fragile steppe ecosystems. As researcher Butterbach-Bahl and his team conveyed in a 2010 issue of Plant and Soil, this transition of herders to partially or fully sedentary pastoral lifestyles not only reduces the fertility and productivity of critical pastureland but also contributes to the accumulation of greenhouse gasses due to the release of previously stored carbon and nitrogen from the soil into the atmosphere. It's not just increased carbon dioxide and nitrogen displacement that's of concern to climate scientists. Larger and more concentrated herds results in more methane byproducts, a greenhouse gas 23 times more potent than carbon dioxide which currently comprises forty percent of the country's emissions. Further pressures on pastureland arise from the effects of high prices of Mongolian cashmere in international markets. In response to global demand, and in efforts to increase their economic resiliency, nomads are intentionally altering the composition of their herds to favor goats—whose numbers have doubled since economic liberalization. Because of their tendency to tear up grasses by their roots instead of cutting them at their bases like cows and horses, greater numbers of goats leads to overgrazing and further exacerbates erosion issues. Alterations in grazing patterns have also decreased the diversity of vegetation on the Mongolian steppe and increased the prevalence of the Artemisia weed. The reduced prevalence of traditionally mixed herds, which have naturally limited environmental impacts through their layered consumption of plants, has proved disastrous—all the more so due to the effects of climate change. Bringing with it an increased likelihood of extreme weather conditions in summer and winter, a changing climate means that these ongoing social and environmental issues have become magnified. The climate in Mongolia is historically known for being harsh, arid, and unpredictable. In recent years, however, the weather has become increasingly erratic—primarily through an increased frequency of dzuds. 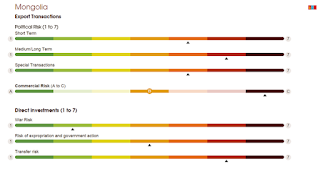 The Intergovernmental Panel on Climate Change (IPCC) chose the Mongolia dzuds of 1999-2002 as a case study on how a changing climate is increasing household risk. As a result of extreme meteorological events which killed huge portions of herds, nomads migrated with their remaining animals to the central provinces; those least-affected by the alternating summer droughts and harsh winter weather. The unfortunate result was that the available grasslands were crushed by livestock levels well beyond the capacity of the land, reducing the productivity of the steppe. According to a 2008 study by Dr. Angerer, between 1999 and 2002, almost 35 percent of Mongolia's domesticated herbivores perished. Frighteningly, this type of freakish series of events is only predicted to increase in prevalence in the coming decades. Mongolian herders are less resilient and more vulnerable than ever as the risk for livestock mortality increases. In his published work Dr. Hannam cites low levels of human capacity and financial resources in the Mongolian government to effectively and fully address the issues facing the rural population, and points to the role of civil society, such as NGOs, to fill the gap. Considering this need, governmental and non-governmental organizations alike should step forward to strengthen Mongolian herders' resiliency by increasing forage production and feed reserves, specifically by implementing projects that promote the planting and cultivation of drought-resistant varieties of forage. The need is real. According to the Asian Development Bank "some 70 percent of Mongolia's land is degraded through overgrazing, deforestation, and climate change." A 2013 study by Punsalmaa demonstrated that "1.9 to 3.3 kg/day supplementary [additional] feed will be required to feed one sheep in the summer in 2020." Increased forage production will ensure that herders are prepared to provide the additional dry fodder required for their livestock, and that a greater amount of grassland will still be available in the summer and fall when animals must consume the most calories and nutrients. A variety of foreign and domestic studies have expressed the need for mitigating the impacts of climate change on herders by increasing vegetative cover of pastures and improving the feed reserves for livestock. Further, research by Rosales and Livinets demonstrates the environmental benefits of devoting increasing amounts of land to forage crops, including increased carbon sequestration, reduced soil erosion, and lower levels of water pollution. First, with the Gobi encroaching northwards by an average of six to seven kilomenters each year, the southern region of Mongolia (particularly Umnugovi) will be especially vulnerable to climate change. According to Drs. Tachiiri and Shinoda, this region will likely also have the highest prevelance of drought and dzud disasters. Secondly, Dr. Hannam states that soil erosion has been exacerbated over the past 40 years due to "inadequate use of soil protection techniques" during cultivation, contributing to high levels of erosion across half of the cultivated land in Mongolia. Finally, the selection of forage species for planting should only consider varieties that are suited for local conditions. Researchers in the Mongolian Ministry of Environment and Green Development have found 15 species that should be considered, including, Medicago falcata, Agropyron cristatum (Chuluut), and Agropyron cristatum (Nart). Once herders increase the drought-resistance of their pastureland and increase feed stock reserves, they will strengthen their resilience against the harsh dzuds and climactic events of the future. There is not much time to waste! The future of Mongolia's herders and the continuation of its national culture depend on the ability of policy makers and stakeholders to act now. June 4 (World Vision) Turning up at the monastery with one goal in mind, to pray for her poverty-stricken family, Anara left with another. Approaching the religious hub, the then 10-year-old was stopped by an elderly woman, who asked her to buy some rice from a nearby grocery store. Seeing Anara, as she is known, return with a one-kilo bag, the woman had one more request: to pour the contents into ten small packets. Loitering on the streets, the woman sold rice to monastery-goers, whose going-through-the-motions good deed was to feed the pigeons. Her good deeds done, Anara said goodbye knowing she would return to sell rice to help her jobless father. "I used to get up at nine in the morning and go straight to the monastery to sell rice," explains Anara, who is now 15 years old. "My classes started at one in the afternoon, so I went in the mornings." "At weekends, I worked the whole day, making two to three [US] dollars," she continues. "And when I badly needed money, I had to skip school to work." Anara's mother died when the girl was young, while her alcoholic father remained unemployed and neglected his two daughters. A World Vision home visitor, Norjin, met the family two years ago in their aging 'ger', Mongolia's traditional shelter, which had no sink, bedsheets or proper floor. Norjin says, "Anara's father had no identification documents, which are essential to get a job or social welfare. So I helped get the documents and World Vision immediately gave them food and clothes." Low household incomes and neglect are the main reasons for childhood work in Mongolia. Child labour is cheap and adults refuse to accept the same meagre wages, preferring to rely on state handouts. Almost 16 percent of Mongolian children ages six to 17 are involved in child labour, a figure which equates to nearly 94,000 individuals, according to the government's National Authority for Children in 2014. Speaking with the website mass.mn last year, the head of the state body's department responsible for child development, Baavgai H, revealed, "Compared to statistics from 2006, the number of child labour cases has increased, which means legislation regulating the involvement of children in labour is not working on the ground." To deal with this, World Vision's home visitors identify and monitor children at risk of abuse, neglect and child labour. Today, nearly 170 trained home visitors work in 20 Mongolian communities, monitoring a total of 935 vulnerable children twice a month. Norjin says, "After visiting Anara's family several times, we became closer. We were like a family. Anara's father was more open and responsible. He started drinking less and looking for a job. "He's now doing construction work to make a living and Anara has stopped working. I'm happiest when I see families smiling and their lives getting better." This year was the turning point for Anara, who has begun a vocational course to be a chef. She says: "I'm in my first year, so I'm learning the basics of cooking, like dough and chopping. But next year, I'll learn how to make lots of complicated dishes." Excited to be studying a useful skill, Anara now dreams of opening her own restaurant. She's on the right path. June 12 (UB Post) A group of students raised five million MNT and turned a regular room for patients into a playroom for sick children at Chinggeltei District Health Center (CDHC). The room needed the biggest upgrade within the hospital and was redecorated as a playroom, as part of the initiative of 20 master's students of the Institute of Finance and Economics. "We came up with the idea two weeks ago (on Tuesday) and redecorated the room in four days. We cleared the room, repaired the required parts, painted its walls, drew murals and put playroom items. The furniture in the playroom was specifically designed and produced for children at our request. Over 150 people joined our initiative and contributed to the playroom," said J.Solongo, leader of the organizing student group. CDHC provides medical services to approximately 180,000 people per day and 52,000 of them are children. "Approximately 5,000 children are hospitalized for extended period at out hospital every year. They, of course, don't enjoy taking medications and getting injected. It is common for them to cry every time. In those times, we desperately need something to distract their fear and pain. Now, we are able to brighten their mood with the playroom," explained Kh.Ulambayar, pediatric physician of CDHC. Hospital staff and parents of the young patients expressed their gratitude to the students as they raised funds and used it for the children they don't know in time of economic recession in the country. In previous years Mongolia witnessed progressive dialogues and cooperative efforts towards the enabling environment creation for volunteerism promotion in the country, which was led by the Office of the President of Mongolia and civil society partners. Currently there are many more promising discussions going on in relation to promotion of volunteerism, civic engagement and youth roles in the Sustainable Development Goals (SDGs) not only at the national level but also at regional and global level. This is an opportune moment, for the government, civil society and volunteering organizations as well as other emerging partners like the private sector, to resume and push forward the dialogue. This will help all stakeholders keep abreast of the recent development on the agenda, suggest constructive recommendations to move on and share common base for collaboration. The United Nations Volunteers' State of the World's Volunteerism Report 2015 will be introduced during the National Consultation Workshop. Simultaneous translation (Mongolian-English) is provided. Please bring your ID to facilitate your entrance to the UN House. To assess the effectiveness of the Maternal and Child Health (MCH) handbook in Mongolia to increase antenatal clinic attendance, and to enhance health-seeking behaviors and other health outcomes. A cluster randomized trial was conducted using the translated MCH handbook in Bulgan, Mongolia to assess its effectiveness in promoting antenatal care attendance. Pregnant women were recruited from 18 randomly allocated districts using shuffled, sealed envelopes. The handbook was implemented immediately for women at their first antenatal visit in the intervention group, and nine months later in the control group. The primary outcome was the number of antenatal care visits of all women residing in the selected districts. Cluster effects were adjusted for using generalized estimation equation. Masking was not possible among care providers, pregnant women and assessors. Nine districts were allocated to the intervention group and the remainder to the control group. The intervention group (253 women) attended antenatal clinics on average 6•9 times, while the control group (248 women) attended 6•2 times. Socioeconomic status affected the frequency of clinic attendance: women of higher socioeconomic status visited antenatal clinics more often. Pregnancy complications were more likely to be detected among women using the handbook. The MCH handbook promotes continuous care and showed an increase in antenatal visits among the intervention group. The intervention will help to identify maternal morbidities during pregnancy and promote health-seeking behaviors. It is hard to believe that winter temperatures in Mongolia can fall to thirty degrees below zero, and even more inconceivable that most residents' houses have no insulation. Heating have costs increased steeply, forcing many Mongolian families to seek methods of saving money, while still staying warm. People in Need promotes the use of wool from local sheep as the best and least expensive material for home insulation. Most of Mongolians live in an outdated block of flats, which are very expensive when it comes to energy. They are forced to seek out new methods of warming their houses, because of the deregulation of energy prices. "This was the reason we tried to replace the import of expensive and often environmentally unacceptable materials with local materials beginning in January 2013," explains Juraj Drábik, who worked for a year and half as a member of People In Need's Mongolian team. He sees a reliable alternative in sheep wool, which is used for insulation after a series of necessary treatments that occur in Europe. "There is lots of wool in Mongolia, and there are about five sheep per head, so it is an accessible and environmentally-friendly material, which can replace the import of fiberglass from China or the purchase of Russian rock wool," he says. Although the wool in Mongolia is one of the country's main products, it is not widely used. There is a low demand for wool and, subsequently, a low profit for those who supply it.. People in Need decided to embrace wool's potential, and focus on the process of treating wool as a thermal insulating building material. PIN emphasized the development of all supply chains, which include individual sheep breeders, small and medium-sized companies, and institutions like state offices and schools. "From sheep breeders, who produce the primary material, we proceeded to enterprises, which process some crude wool and produce insulation from that, up to companies, which will use that wool while they build new buildings or repair the old ones. We also cooperate with regulatory offices, because it is necessity to standardize and certify this new product," clarifies the project coordinator, Amgalan Ariunbold. Since the concept of green and low-energy building is quite new, People in Need had to formulate a marketing campaign that would present the final product to the public. "The campaign included articles in magazines, TV slots, booklets, and even a documentary film," says Amgalan Ariunbold. The new product will be produced in four or five factories at different locations in the Mongolian territory in the future, where they should employ around three hundred people. Cooperation for this initiative is thriving at the political level as well. "We succeeded in procuring the national product certification - thanks to that, the wool insulation can be considered a standard material in the building industry," noted the head of the Mongolian mission of People in Need. Long distances and lack of infrastructure cause large gaps in the living standards of inhabitants in the main city and of those in the countryside. Therefore, People in Need also focuses on the work of nomadic herdsman, who produce the main material for the new product. "This past summer we organized the training of two hundred herdsman from the northern region of Mongolia about the right way to shear sheep. This year, we plan to organize another training during which the herdsman will learn how to sort wool, thus increasing its value," says Amgalan Ariunbold. "The processed wool should serve as the insulation material of those houses occupied by poor people in the countryside or in the dwellings of ex nomads living in the periphery of Ulaanbaatar. The warm insulation should drastically increase the quality of life in the country, where the winter can last eight months," she says. MEDORA, June 10 (The Dickinson Press) — A group of Mongolian officials stood at an overlook atop a grassy lip Wednesday afternoon, looking over the brown-orange buttes that unfold for as far as the eye can see at Painted Canyon in Theodore Roosevelt National Park. It's the last stop for the group, which has spent time touring U.S. national parks as part of a transnational sharing expertise of park management issues that was hosted by the Wildlife Conservation Society. Though the two countries are thousands of miles away, WCS Extractive Industry Project Manager Kina Murphy said ecosystems in Mongolia and North Dakota closely resemble one another. "The ecosystems are almost identical," she said. "There are different species that exist in the two ecosystems, but they are really functionally the same. They have the same resource use issues and the same issues with herding and ranching." Murphy said the group stopped at Grand Teton, Yellowstone and the Badlands national parks during their travels. And while the stop at Theodore Roosevelt National Park was the last, it's one Murphy said was especially important because of oil and gas extraction. She said extraction was a big topic of discussion during the meetings between parties. But they also discussed wildlife disease, poaching, fire and habitat encroachment. Protected pieces of land in Mongolia have only existed for 20 years. Murphy said the U.S. has around 100 years of experience and is able to provide insight into issues it has worked through in the past. In addition, Mongolia is also facing rapid expansion of its protected land, which has led to issues such as installing a park fee system. Entrance prices for parks are set at different rates for natives and foreigners, which are currently set low and are siphoned into the general treasury and not back into the park system. Through the meetings, she said ideas were discussed on how to relieve the issue. While Mongolian officials reported a long list of learning points to implement in their home country, employees at Theodore Roosevelt National Park said they too learned from the exchange. One of those things was the utilization of buffer zones, which could help mitigate external impacts mostly as a result of the oil and gas industry. "I think when people are sharing, it's a great thing but when you have culture sharing, that's a really broad level, and I think we can learn a lot from each other's cultures," said Theodore Roosevelt National Park Acting Superintendent Wendy Ross. While the group is planning to return to their native country, the director of Numrug National Park — who did not give The Press his first name but is known as Mr. Batbold among the tour group — said it's a relationship he would like to see remain. To continue sharing information in the future, the two entities discussed becoming sister parks, which would open a direct channel for communication between the countries. It's something officials at the North Dakota park said they too would like to see in the future. "The goal of this visit was to see how U.S. parks are managing and see and share information," Batbold said. June 11 (Pravda.ru) Interview with Richard Kock*, Professor of Wildlife Health and Emerging Diseases Royal Veterinary College, London, on the sudden catastrophic die-off among the Saiga antelope which places this wonderful animal that roams around the steppe of Russia, Kazakhstan and Mongolia in critically endangered status. Interview conducted by Timothy Bancroft-Hinchey, Pravda.Ru. Pravda.Ru: How deep is the impact of the current die-off for the Saiga antelope and its continuation on our planet? Professor Richard Kock (RK): This is a catastrophic event on a recently recovering population affecting what was its most viable population remaining globally. This puts the animal firmly back into a critically endangered status and extinction is now a high risk in the medium to long term. 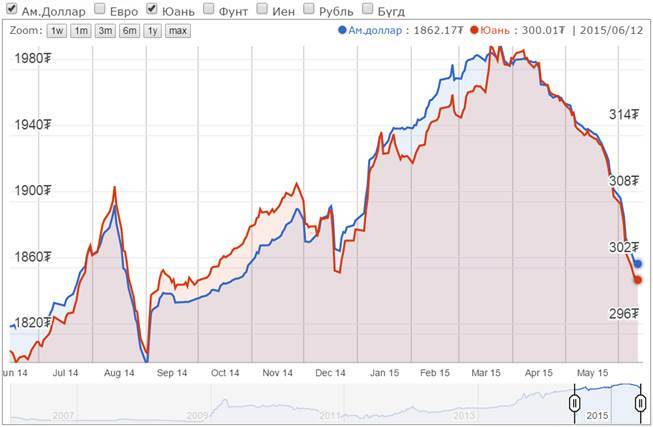 Pravda.Ru: Is there anything unprecedented or strange about the current die-off compared with previous events? a) placement of collars to enable tracking and identification of calving sites early enough for direct monitoring. c) collaborative research to better evaluate the causes of outbreaks and nature of the diseases. So direct comparison with earlier events is difficult. They might be the same cause or similar or not. What is surprising is the mortality rates in an aggregation of saiga which is 100%. This is extremely unusual in biology and disease ecology. Pravda.Ru: Have the researchers uncovered any clear links between the parasites and the Haemorrhagic Syndrome and toxaemia/septicaemia which is killing the animals? RK: There is evidence that P.multocida is a primary agent in causing this Haemorrhagic Syndrome but there may be syndemics and polymicrobial aspects, particularly clostridia but this needs further study. Histology should help to elucidate the pathogenesis and likely bacterial disease as the proximate cause of death. Pravda.Ru: How well have the Kazakh authorities been coping? Has there been an important international response? RK: Due to what I stated above, the Kazakhs were better prepared to investigate the die-off than before and have shown a very transparent and constructive approach to this problem. The RIBSP lab is doing excellent work and the Veterinary Services have been supportive. The international community has been highly responsive including the CMS, UNEP and IUCN and various academic bodies and agencies with an interest in disease emergence. Pravda.Ru: Have you or your team been active in other areas affected outside Kazakhstan, such as Russia and Mongolia? RK: We maintain contact with various scientists in the Academy of Sciences in Moscow and with NGOs active with the small saiga population in Mongolia. Pravda.Ru: What are the probabilities that human activity is the root cause of this dramatic situation? RK: It seems likely that there are some triggers and underlying factors driving this event which might have roots in human activities - the most likely being climate change. In addition the overall impact of poaching and disturbance of saiga through hunting and agricultural practices in the range are reducing the resilience of this species to events such as this. There may even be pasture factors which relate to the overall climate and environmental changes which could have acted as triggers some of which might be influenced by agricultural practice and range use by saiga. Pravda.Ru: Is there any evidence of toxic substances being behind this die-off? RK: Toxicology needs to be done on the samples collected and if found in the carcasses this will help to lead to possible toxic factors but there is no clear evidence on this presently. * Professor Richard Kock (59) is Professor of Wildlife Health and Emerging Diseases at the Royal Veterinary College in London, one of the most prestigious Institutions of its kind in the world, and has worked for over thirty years in Veterinary Science, Conservation, Epidemiology and Pathology around the world. I was 11, maybe 12 years old, when I first realised I could be a contortionist. June 13 (Herald Scotland) I grew up in Ulan Bator, the biggest city in Mongolia. In Mongolia, over the last 40 years, many more girls want to become contortionists, like girls over here go to gymnastics or ballet. Some of the world's top acts come from my country, performing everywhere from the Bolshoi in Russia to Monte Carlo and Cirque du Soleil. I was inspired by watching my aunt Ione. She is a wonderful contortionist, very clever and elegant, and I wanted to be like her. I have idolised her since I was little and I always wanted to do this, to follow in her footsteps. My auntie helps me a lot, still, with my act - she is always there to advise me on how to do things better. She is married to Beau, who runs Zippo's Circus, and she is very helpful to me as I travel round the country with them. Travelling around the world was my dream. I wanted to be able to see places and experience things and, in particular, I wanted to come to the United Kingdom. I remember my very first show, in Turkey, when I was quite nervous. It all went so fast, though, once I went into the ring, that I hardly had time to be scared. Now I am never nervous when I perform. It makes me very happy, doing what I do, and it is good fun. I have no idea what I will do when I am no longer working as a contortionist. I do not like to think about it, I just want to keep working. It is hard work, staying supple, but so far I do not feel as if it is any harder now, as I get older, than it ever has been. But I have to practise and practise, all the time. I have to train every day, doing exercises like handstands, splits and press-ups, to build up my strength, flexibility and balance. This year, I have added a new trick to my act - I fire an arrow from a bow, with my feet, while I am doing a handstand. It is a trick I taught myself. I always want to do exciting things, new things, that keep the audiences impressed. I can also wrap myself up into a bottle. I am tall, at five foot eight inches, and it is quite a small bottle. That is how I make my entrance, into the ring - I'm Odka, the girl in the bottle. Audiences love it. Being part of Zippo's Circus is incredible. Sometimes, after the shows, the little girls who have been watching me come to meet me and show me how they can bend and move. I see them practicing and it is lovely to think I inspire them. Contortionists work hard to impress. I think people are fascinated by us, because we do things that no-one else can do - we achieve what seems impossible. I was born in Sukhbaatar and studied at the State University of Arts and Culture, Ulan Bator. I have won several awards, including second prize and the audience prize at the 2011 International Tchaikovsky Competition; joint first prize in Operalia 2012 and second prize and two special prizes at the International Singing Contest Francisco Viñas in 2013. I am Principal Soloist of the State Academic Opera House of Mongolia in Ulan Bator and was awarded Honored Artist of Mongolia at the age of 24. Roles I have performed in Mongolia include Escamillo, Morales Carmen; Tonio Pagliacci; Amonasro Aida; Count di Luna Il trovatore; IagoOtello; Renato Un ballo in maschera; Sharples Madama Butterfly; Scarpia Tosca; MarcelloLa bohème and the title rolesEugene Onegin, Aleko, Genghis Khan and Rigoletto. I have appeared internationally as Vedenetsky guest Sadko in Krasnoyarsk and as Count Monterone Rigoletto at Palau de les Arts Reina Sofia, Valencia, both in 2012. Also, I have sung in gala concerts throughout the world, including Paris, Moscow, New York, Beijing, Seoul and Singapore. I am looking forward to performances in Switzerland and Kazakhstan as well as at home in Mongolia. In my spare time, I enjoy watching horse racing. June 12 (news.mn) Mongolian band Khusugtun won second place in Asia's Got Talent Show in last months. Therefore, we invited composer and musician D.Ariunbold in as a guest. -How did you feel, when Khusugtun took second place? -Actually, I was felt quite sad. We were pretty sure, that we would win the competition. But it is not the end. More competitions lie ahead. We will continue to work hard for greater success. -Did you get very active support from Mongolians? -That is why I was sad we didn't win. Mongolians around the world supported us with their whole hearts. I think that we let them down. Mongolians are really strong, when they are united. -Khusugtun has many experiences of the world stages, how did this compare? -Well, that was not biggest stage we've performed on. We have been on a variety of big stages around the world. But this time was different because the competition was different. It affected our mind and our moods directly. We realized that many things can play a part in whether you win a competition or not. -How strong were the rival teams? How friendly were you guys with them? -There were no bad rivals especially among the last 24 teams. We were able to see the development of Asian arts. I think we learned a lot of new things from each other in every performance. Although, performances are secret until the show, we could see many things from the video recordings. -I heard that you guys received an offer to co-operate. Is this true? -Yes, after the show we received an offer. But right now, it is not official yet. When we make an official contract, we will let you know. -I guess, the judges were interested in Mongolia? -Yes, especially in National Art. The biggest heritage from our ancestors is the national art. Many people, including the judges were really impressed that our national art is so natural and unbroken. -Did the Ministry support your team for the competition? -Not in the slightest! The show organizers paid our travelling fees. If the Government supported national arts, we would be much closer to the world stage. We were originally set up to keep alive national folk songs for youngsters. Unfortunately, they prefer foreign music. But our national art is individual and valuable in the world. June 12 (AFP) The slapping sound of colliding flesh reverberates through a basement in Mongolia's capital, as Tsogt-Erdeniin Mendsaikhan hones fighting skills in pursuit of his dream -- sumo wrestling in Japan. The teenager is inspired by Hakuho, a Mongolian grand champion, or "yokozuna", who in January broke a more than four decade-old record when he won his 33rd Emperor's Cup, awarded to the champion of the bi-monthly top tournament. The feat was "absolutely amazing", said Mendsaikhan, clad in a black loincloth, or mawashi, at a practice session at Ulan Bator's sole amateur sumo wrestling club. "A Mongolian reached the peak of Japanese sumo and raises it higher and higher." Kublai Khan's attempts to subdue Japan more than 700 years ago failed when "divine winds" -- or "kamikaze" -- are said to have scattered his ships, but over the past quarter century a new invasion has seen Mongolian wrestlers take over the country's proud national sport. No Japanese has won a top division tournament for nine years, and all three rikishi, or wrestlers, currently ranked as yokozuna are Mongolian. The last Japanese to hold the coveted title, Takanohana, retired in 2003. Yokozuna must not only be adept at slamming opponents out of the dohyo, the mound of clay and sand that serves as a ring. Sumo is heavily imbued with the values of Japan's indigenous Shinto religion and yokozuna perform rituals in the ring and out, including one for the New Year at Tokyo's Meiji Shrine, donning a sacred white rope, clapping their hands and slapping their bare feet onto the ground. When foreigners first approached the sport's pinnacle in the 1990s, conservative voices asked whether they had sufficient understanding of the country's culture and manners -- often described as "hinkaku", or dignity -- to fulfil that traditional role. Such sentiments are heard less frequently now, although Hakuho found himself at the centre of controversy earlier this year for taking issue with a judge's decision -- a sumo no-no. Still, Japanese schoolteacher Yuko Asakawa said the Mongolians have helped to revive sumo's popularity. "Hakuho is performing with quite a lot of dignity, very similar to Japanese," she added. "Of course, as Japan's national sport it's better if there are a lot of Japanese," she said outside the sport's premier venue in Tokyo, where the latest tournament in May was again won by a Mongolian. Mongolians are not the only foreigners active in sumo, with current rikishi from as far afield as Bulgaria and Brazil, but except for two -- from Hawaii and American Samoa -- who became the first foreigners to reach yokozuna in the 1990s, none have had the success of the hulking heroes of the Mongolian steppe. Sumo is said to date back some two millennia in Japan, while there are variants of traditional wrestling across Asia -- a similar activity is depicted in bas relief at Angkor in Cambodia, and in tomb art of the ancient Koguryo kingdom in what is now the Korean peninsula and northeast China. In Mongolia, the country's traditional form of wrestling -- or "bokh" -- is a revered national sport, known as one of the "three manly skills" along with archery and horsemanship. It also carries a spiritual side, with grapplers performing a pre- and post-match "eagle" dance, flapping their arms in symbolic flight. But the Mongolians' dominance in Japan has prompted soul-searching akin to English self-doubt around their team's perennial failure to win football's World Cup. Retired Japanese rikishi Shuhei Mainoumi published a book last month titled "Why Can't Japanese Become Yokozuna?" He says the youth of his country have grown soft in one of the world's richest societies and lost the drive that Mongolians retain. Sumo winnings may be modest compared with other professional sports, but can go far in Mongolia's smaller and still developing economy, he adds. "Unlike Japanese, they have a hungry spirit," he wrote. Some wrestlers have returned to Mongolia, leveraging their Japan experience into prominent careers outside the sport. Davaagiin Batbayar, who competed as Kyokushuzan until 2006, went into politics, serving in parliament before becoming a special adviser on Japan to Prime Minister Chimediin Saikhanbileg. He reckons there are currently about 25 Mongolian wrestlers, including Hakuho, that he has sent to Japan. Still, he cautions that for many post-sumo life can be tough. "They are so respected in Japan and then come back to being regular people in Mongolia," he told AFP. "People will just say, 'ah, so-and-so was a sumo wrestler,'" he added, stressing they must work hard and develop themselves beyond the sport. Mongolia's first yokozuna Dolgorsurengiin Dagvadorj, who wrestled as Asashoryu, won 25 championships and now concentrates on business interests, including banking. His tumultuous career was cut short after outside-the-ring scandals, though he stresses his time in Japan left a lasting impression. Wrestlers are exposed to values such as trust, honesty, punctuality and diligence there, he told AFP. "There are many things Mongolia can learn from Japan." He also stressed that sumo carries aspirations for Mongolians as baseball does for Japanese pitchers and sluggers pursuing their "American Dream" in the US Major Leagues. "The 'Japan Dream' for Mongolian boys is sumo. It's the same." June 12 (gogo.mn) Recent statistics show that 44% of the Mongolians travel abroad every year on leisure purposes, and domestic travel has increased 5 times in the past few years as UB citizens are getting accustomed to spending their summer holiday outside Ulaanbaatar at national parks enjoying activities such as hiking, fishing, horse riding, camping, or visiting families in the countryside. One can easily observe this growing habit of travel in Mongolians from rapidly increasing number of outbound travel agencies, travel equipment shops, and domestic tour products offered on the market. Ulaanbaatour is the first travel expo dedicated for the Mongolian travellers and expats to help them plan their holidays both in Mongolia and abroad, and is to be held on 19-21 June at Misheel Expo Centre in Ulaanbaatar. The expo is open to exhibitors such as international and domestic travel providers and destinations, air ticketing agencies, travel equipment sellers, transport and travel insurance providers, manufacturers of food and souvenirs, national parks, museums and performances and the like. The exhibition halls are divided into destination pavillions such as the Americas, South East Asia, Europe, Russia, China and Mongolia (major tourist destinations & Ger camps in Mongolia will be exhibiting), and already registered exhibitors include Saint Petersburgh in Russia, Bulgaria, Inner Mongolia in China, Laos, South Korea to name a few; and Okinawa in Japan is the official partner destination this year. Besides travel service providers exhibiting, there will be series of events such as lectures on numerous travel destinations, how to travel responsibly both in Mongolia and abroad, how to plan overseas travel etc, and musical performances by famous Mongolian ethnic music groups. For more info on exhibiting please contact the organisers at +976-9900-2007, 9911-3799 (English speaking), or email atulaanbaatour@gmail.com. Prepared by Zola, General Manager of Mongolian Tourism Association for GoGo Travel. © All rights reserved 2015.